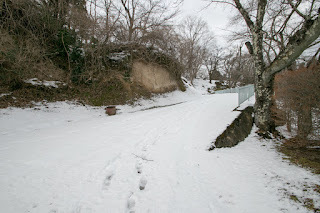 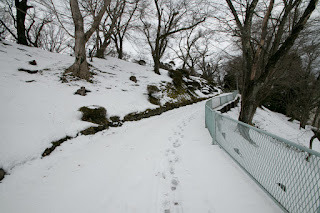 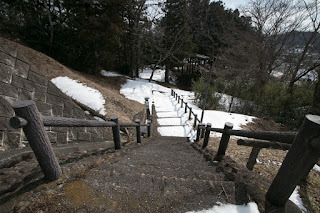 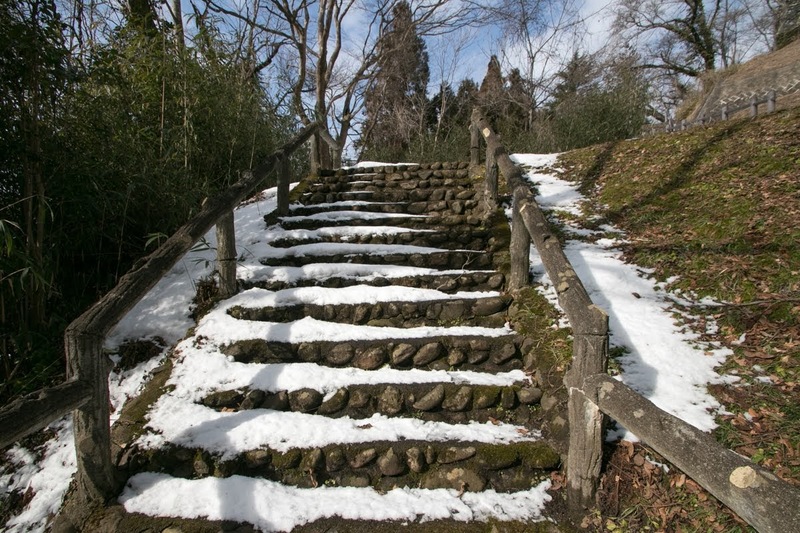 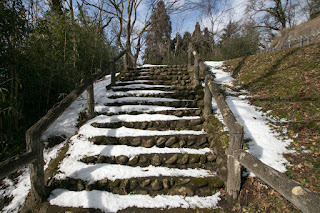 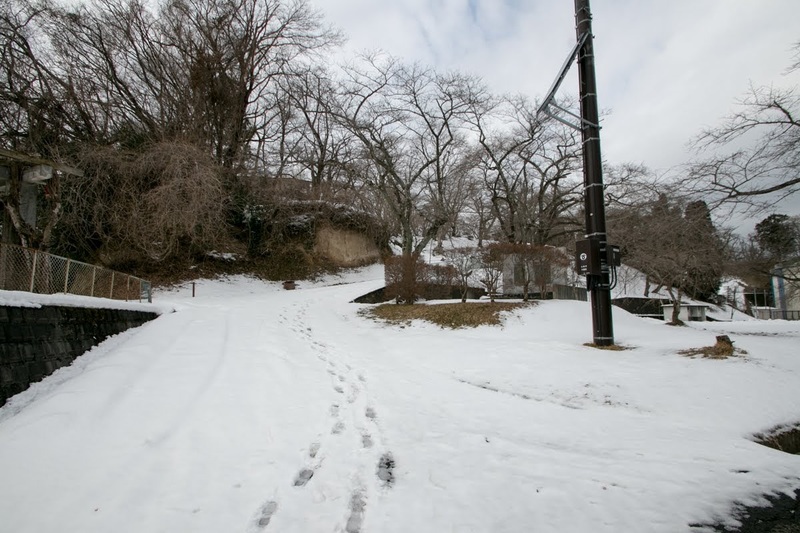 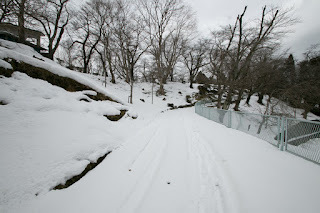 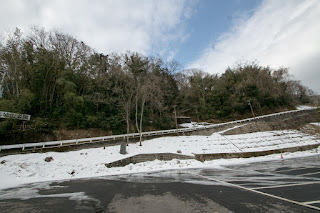 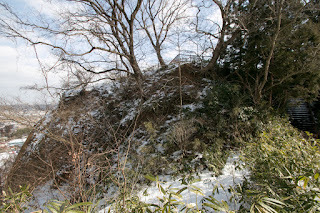 Iwadeyama castle (岩出山城) is located at Shiroyama mountain, one of about 50 meter height from hillside in the northwestern part of current Osaki city. 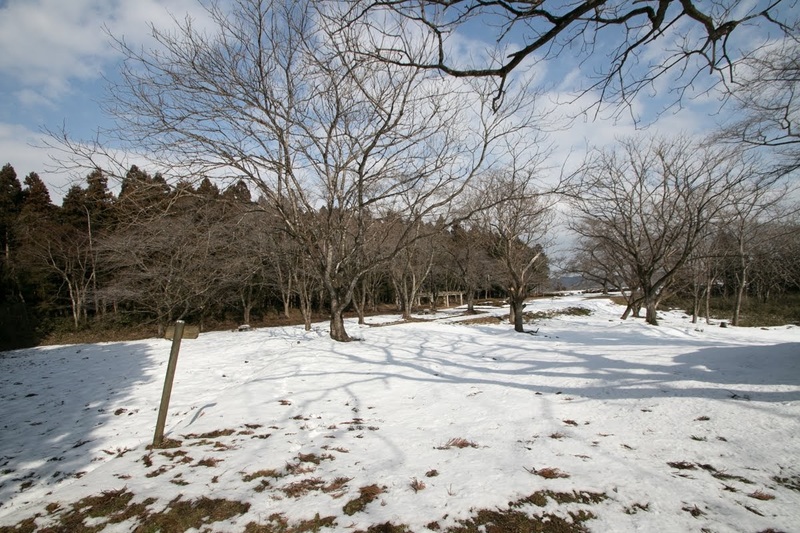 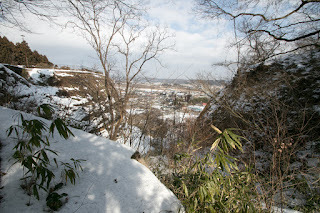 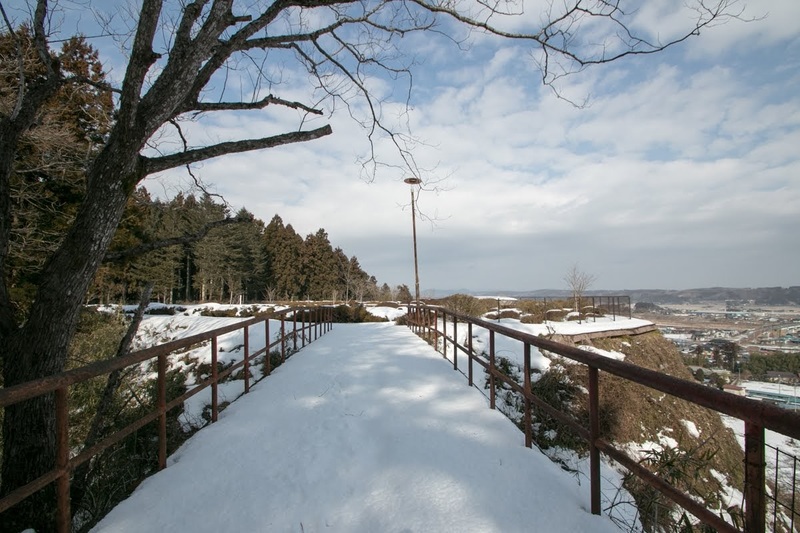 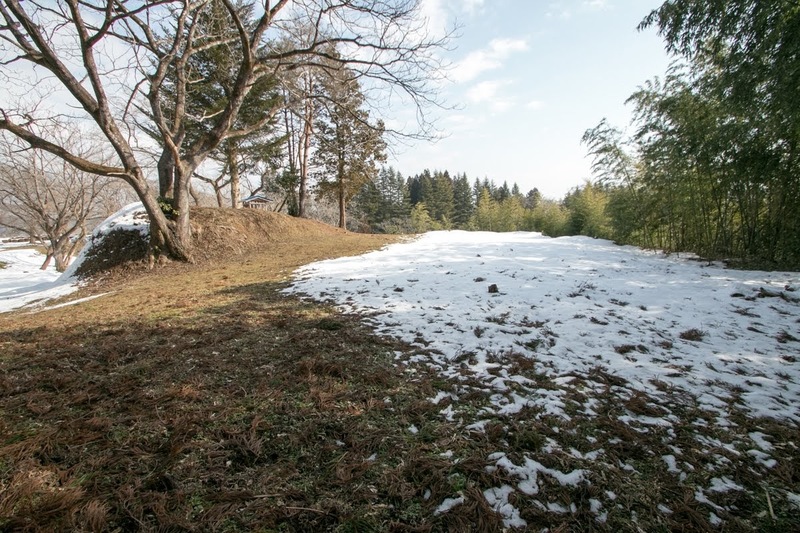 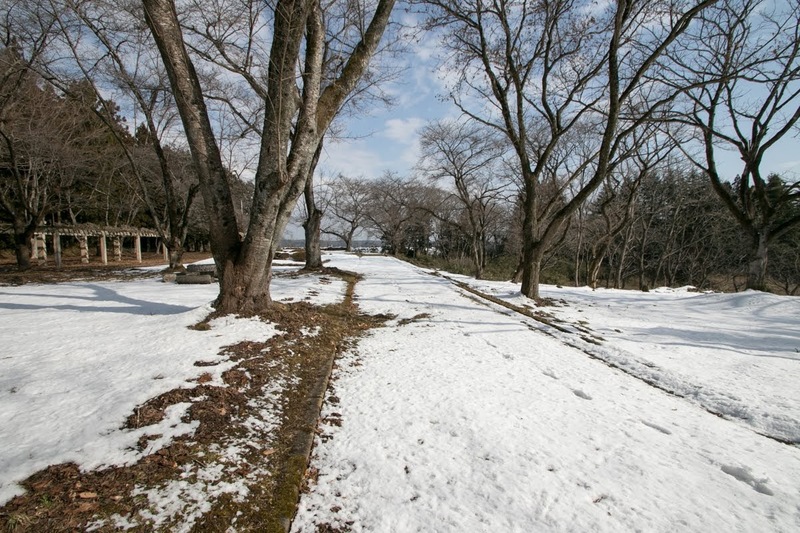 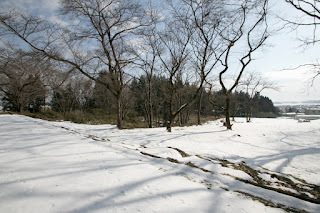 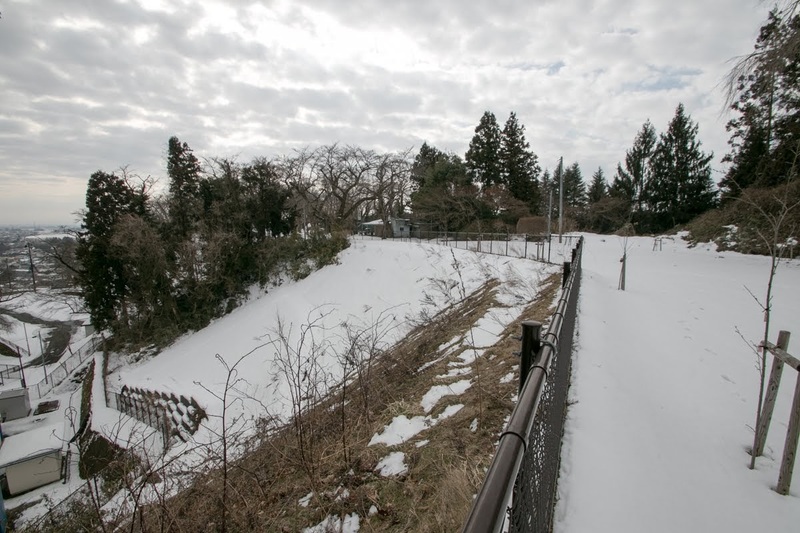 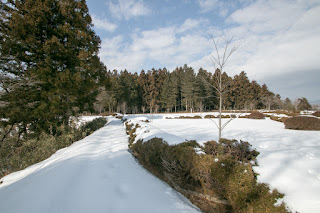 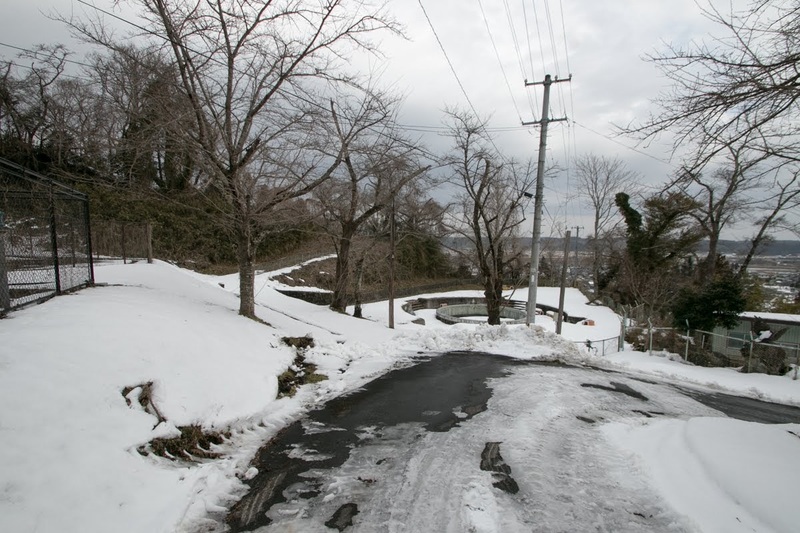 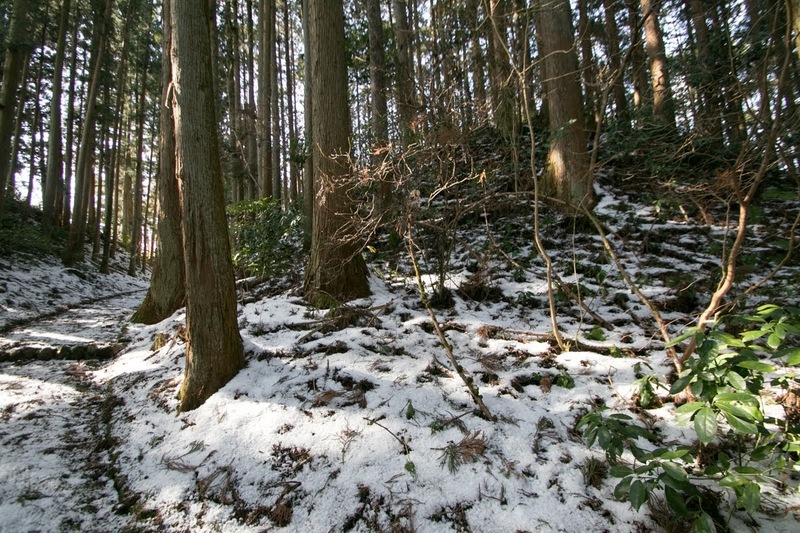 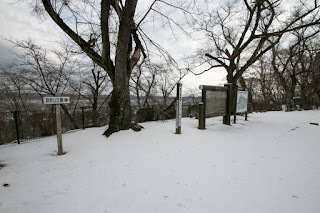 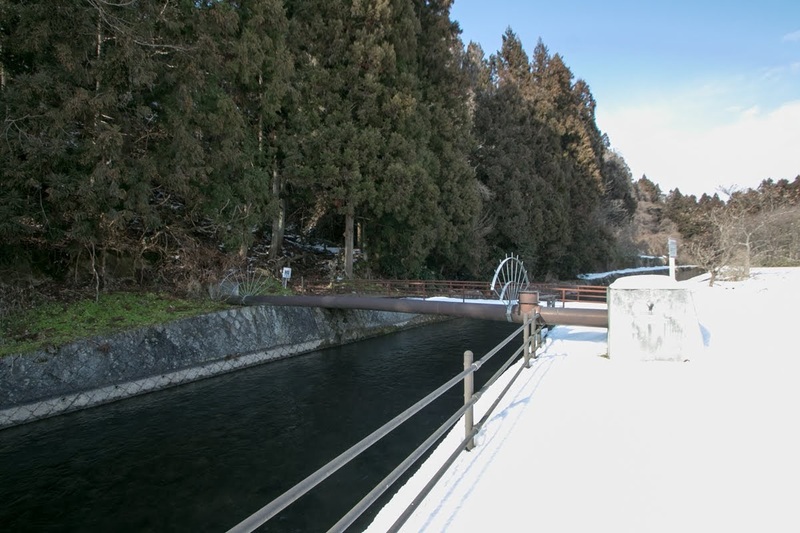 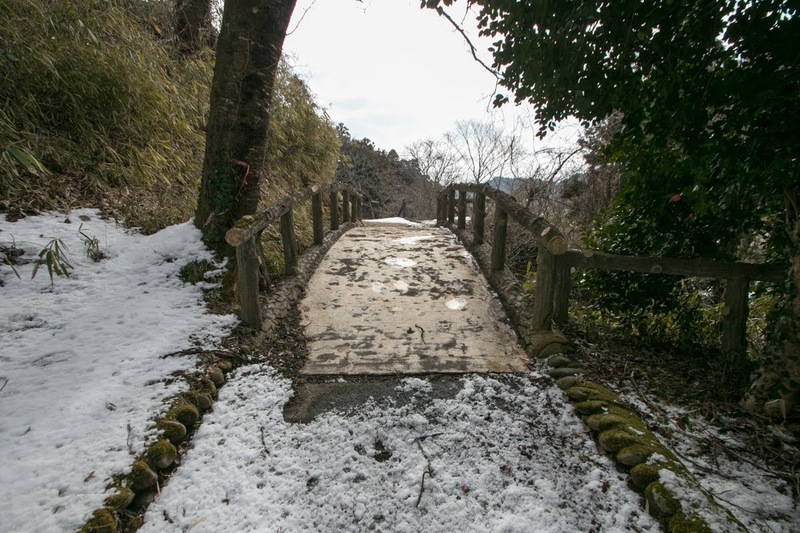 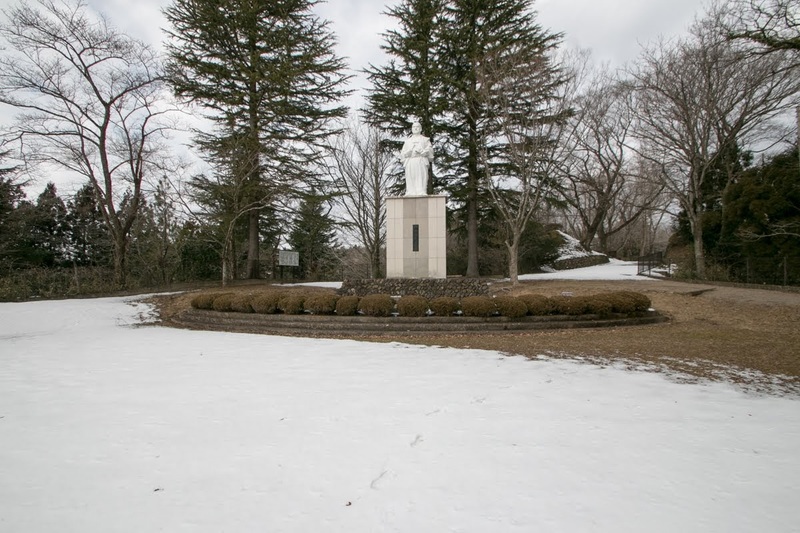 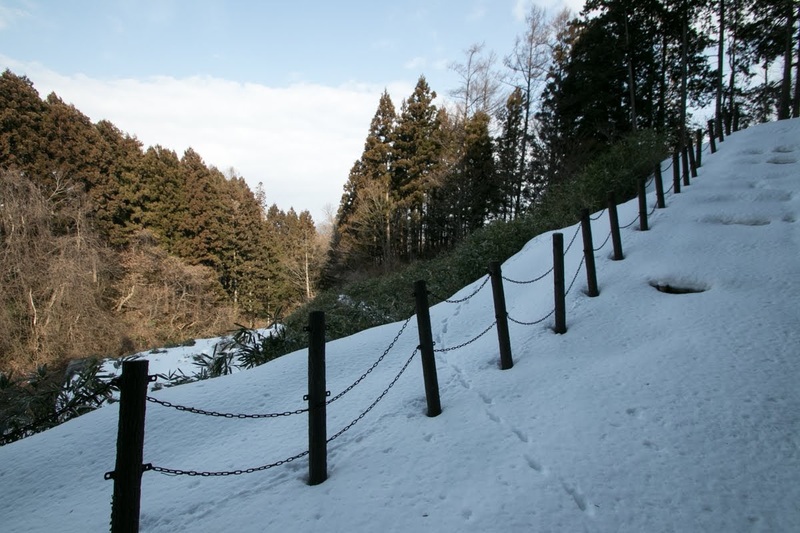 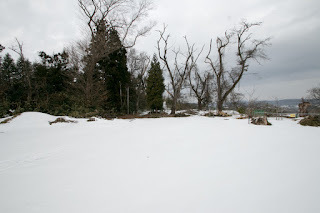 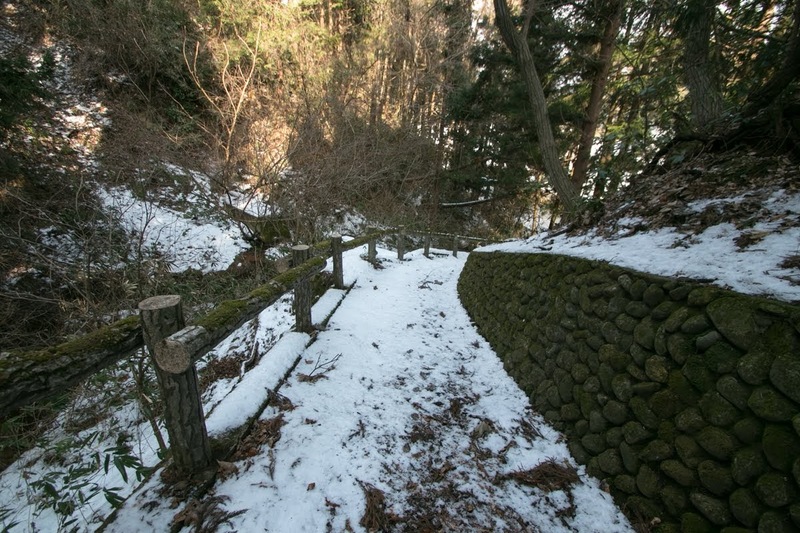 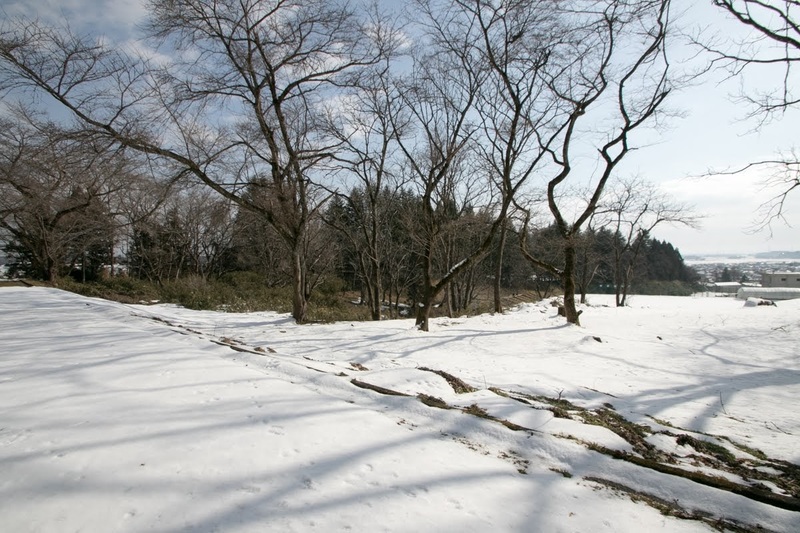 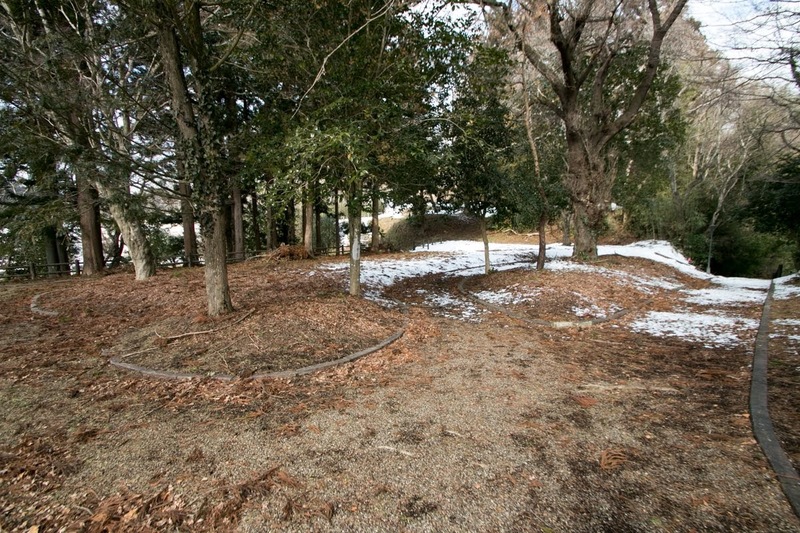 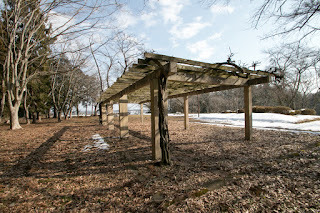 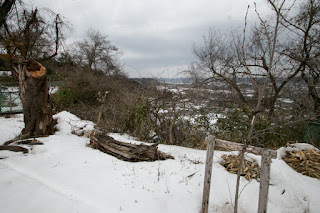 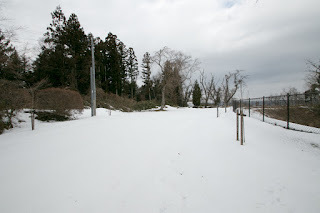 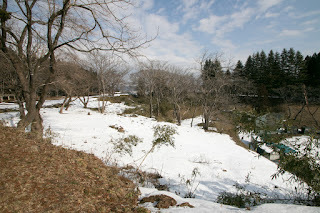 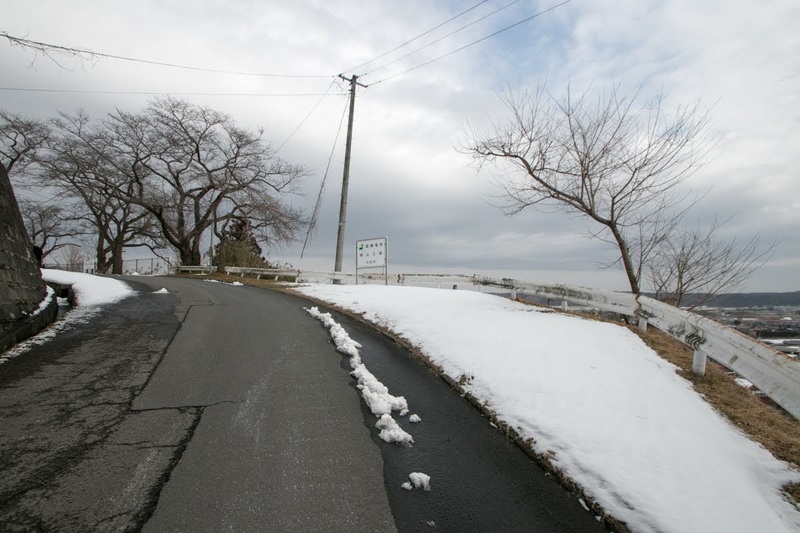 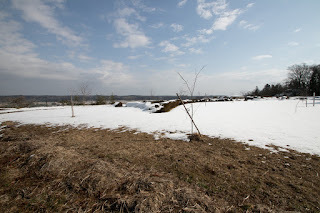 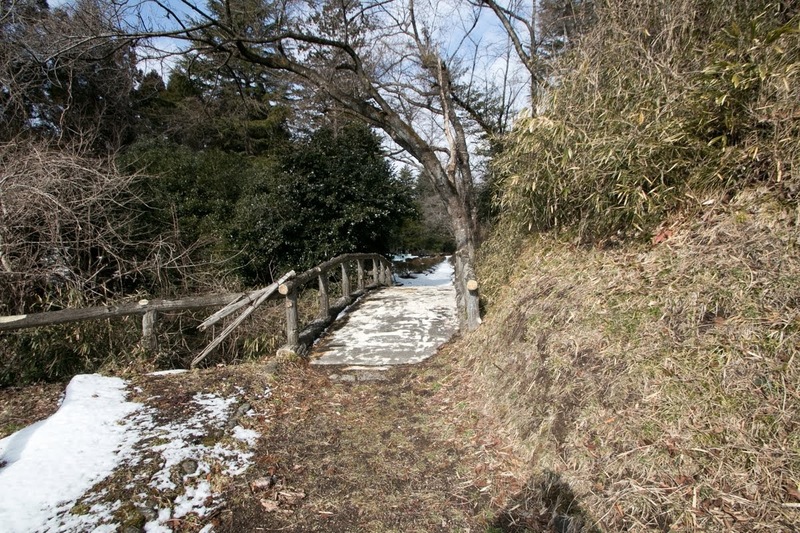 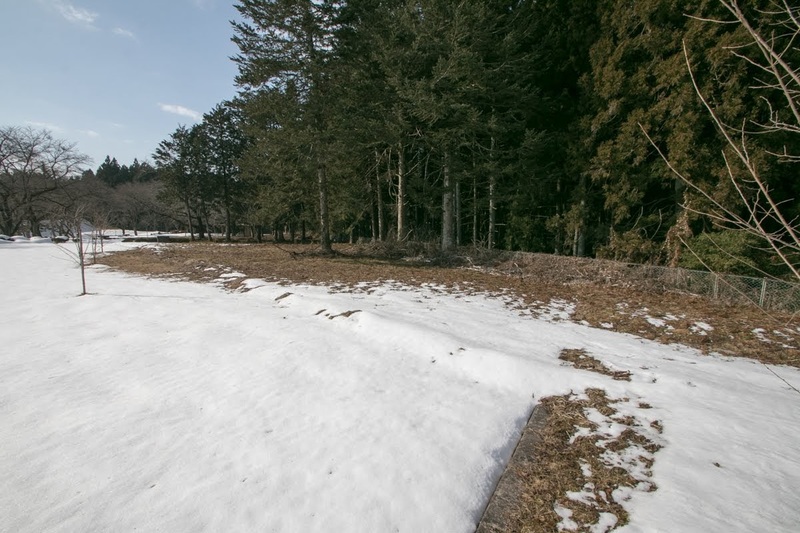 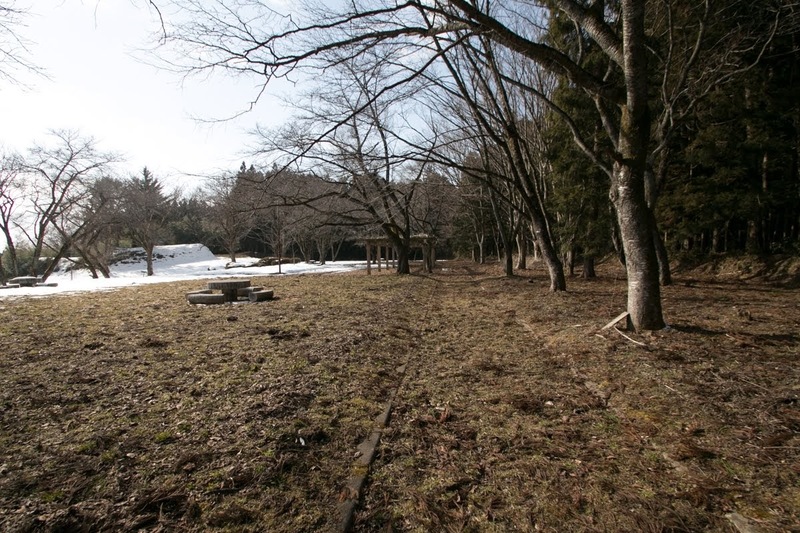 Castle site is at the western border of Osaki plain, and utilizes a height at the edge of Oshu Mountains eroded by Eai-gawa river and other small rivers. Osaki plain is one of two large plains of Miyagi prefecture along with Sendai plain. Gentle but flat slope with numerous creeks is ideal for rice cultivation, this area had developed since 7th century. 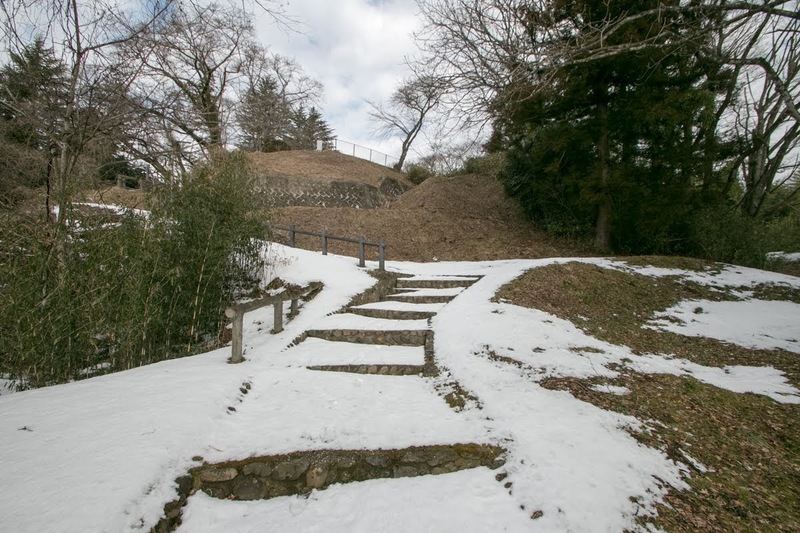 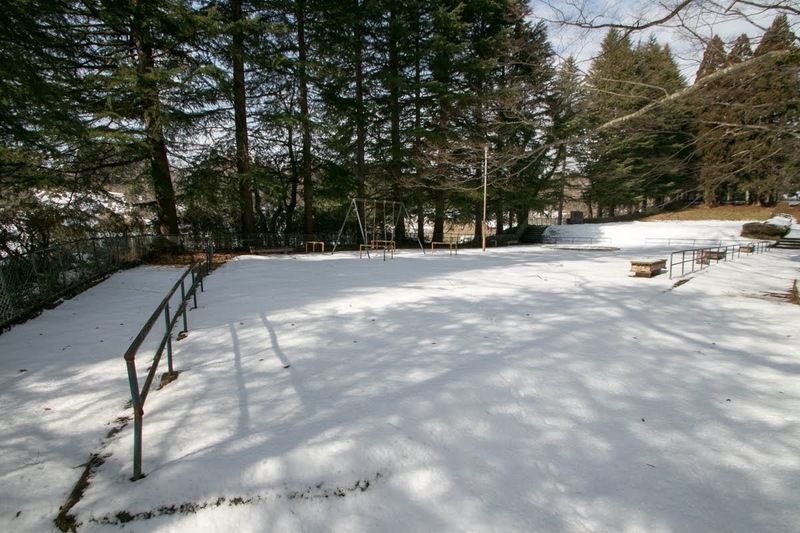 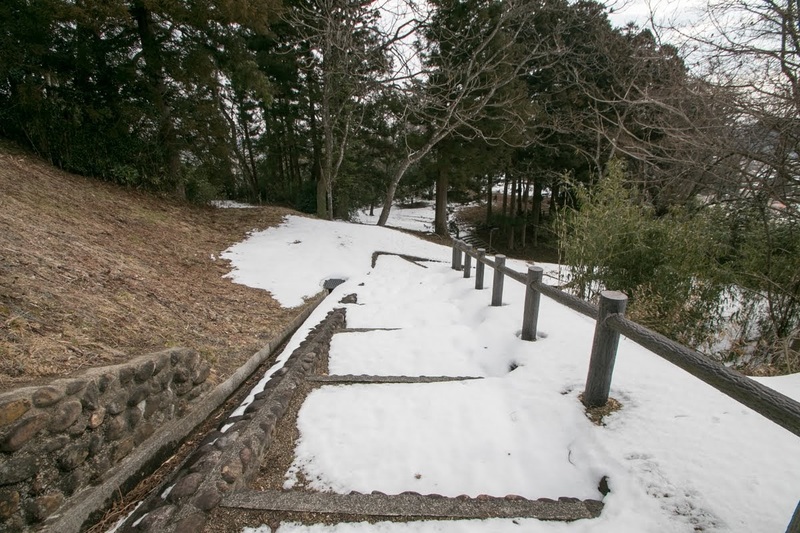 Near from Iwadeyama castle, there is a ruin of old administrative office built at 7th century, earlier than Tagajo castle which was a vice capital at Tohoku region. 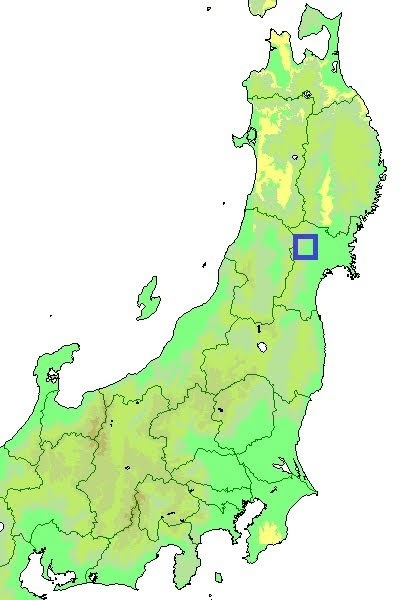 Furthermore, Osaki area is a cross point of Oshu Kaido road spreads north and south, and east and westward road toward Sanriku coast or Yamagata basin. 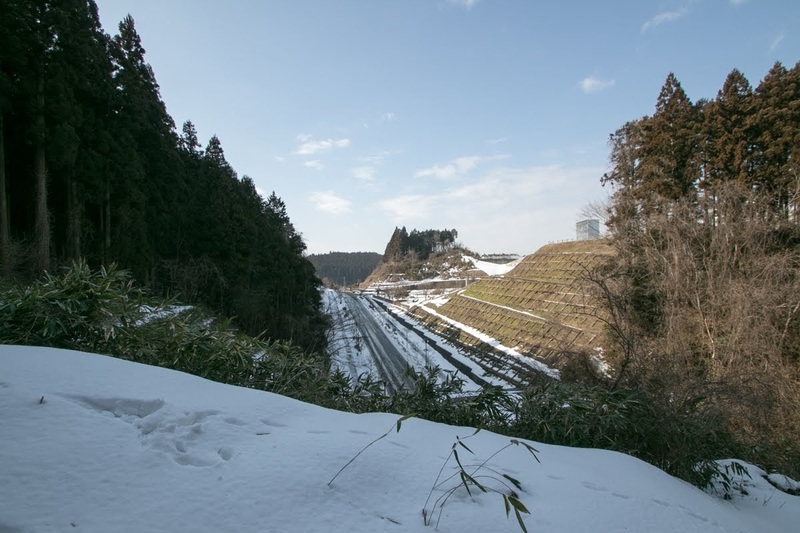 Taking advantage of solid ground and good access, other than traditional agriculture, this area becomes important for industrial and commercial purpose. Iwadeyama castle, which was originally called as Iwadesawa castle, was originally built by Ujiie clan, which was a retainer of Osaki clan that was appointed as a general governor of Tohoku region by Muromachi Shogunate in 1353. 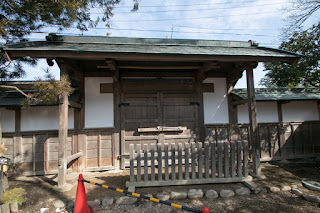 Ujiie clan itself was a descendant of Utsunomiya clan which was a traditional lord of Utsunomiya castle (Tochigi prefecture), and accompanied Osaki clan left for his territory. 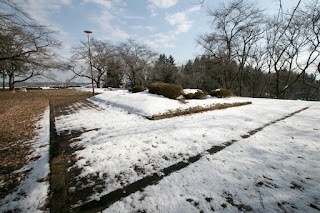 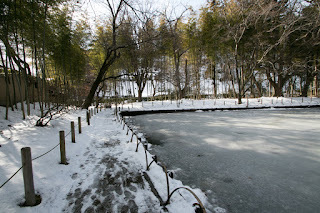 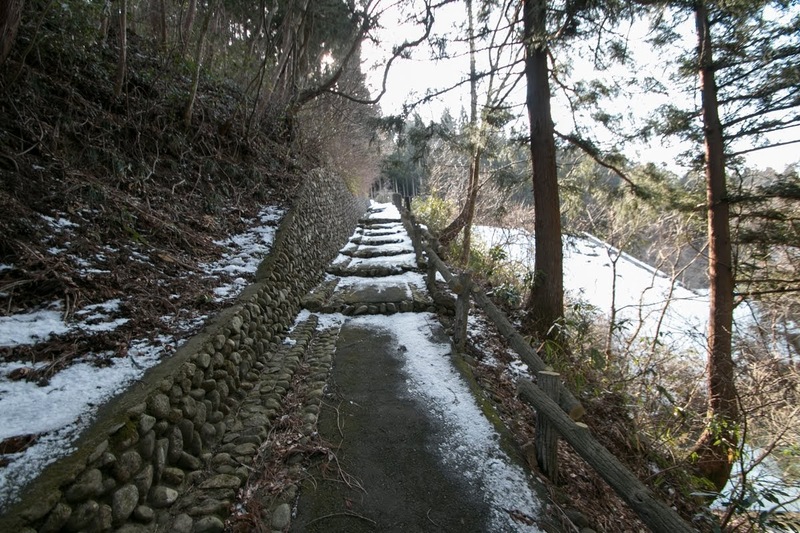 Ujiie clan built Iwadeyama castle at northwest of Nyu castle, the main base of Osaki clan, and used as their main base. 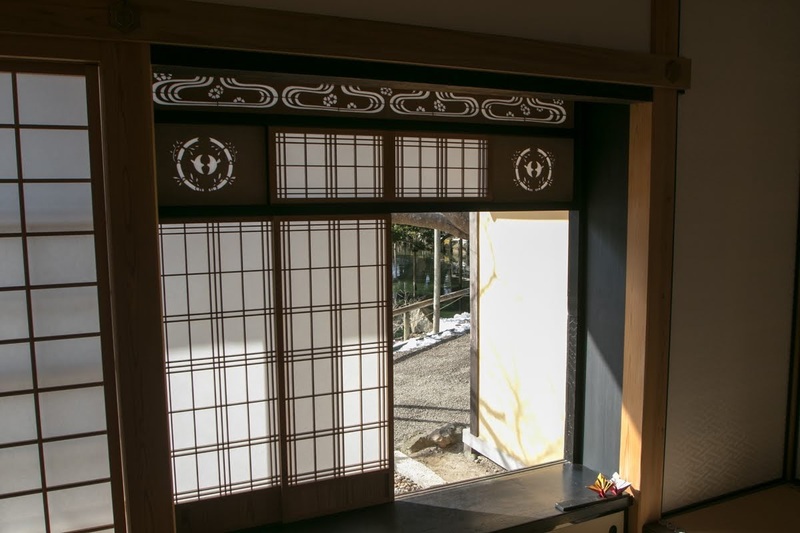 After that Osaki clan prospered as the highest class retainer of Muromachi Shogunate in Tohoku region over 200 years, and Ujiie clan supported Osaki clan as a magistrate. 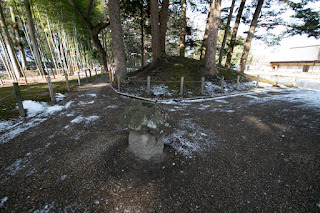 But because of continuous internal conflict and growth of local lords such as Date clan, Ashina clan or Mogami clan, Osaki clan gradually lost its authority and fell into local lord. 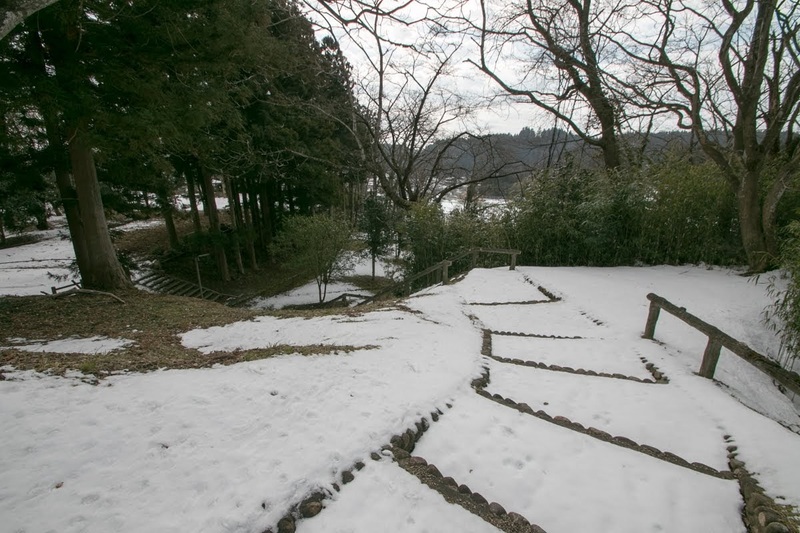 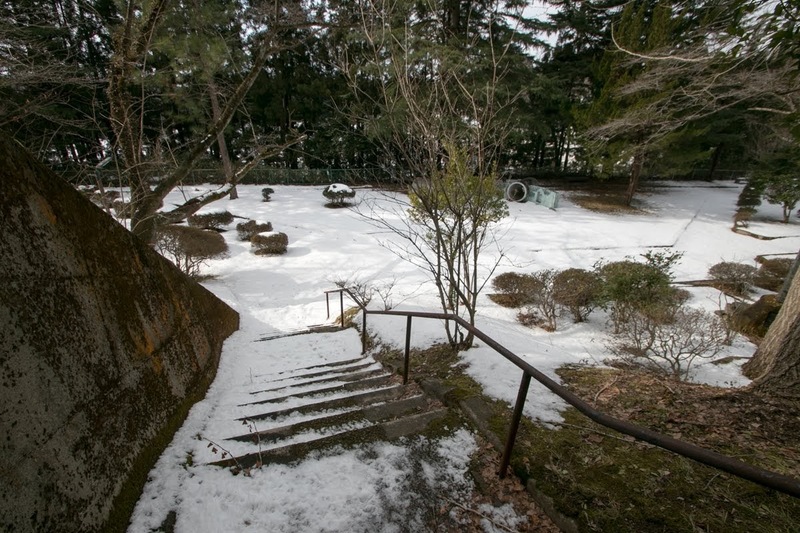 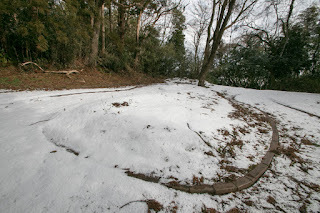 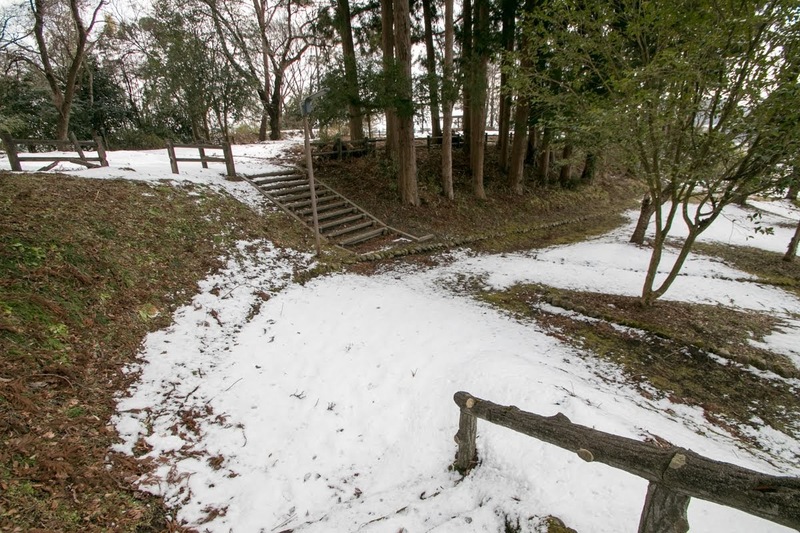 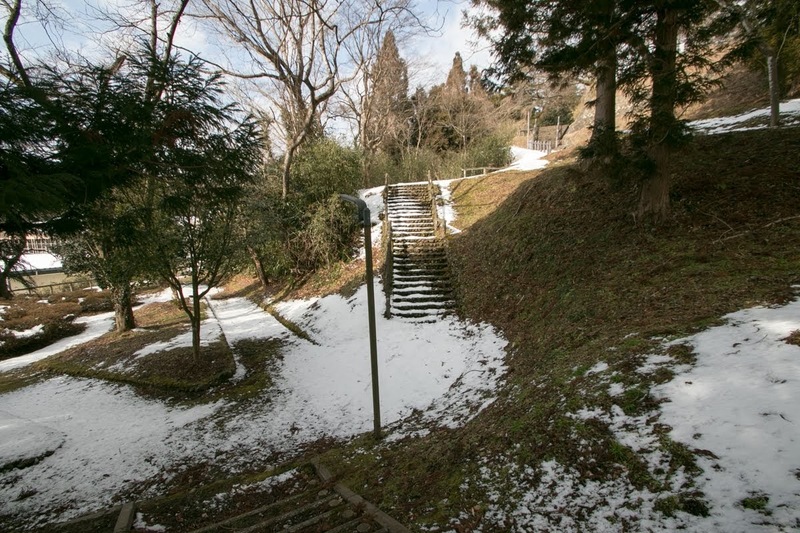 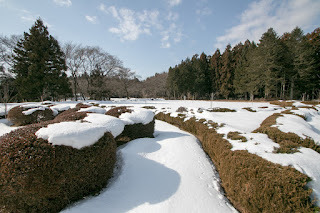 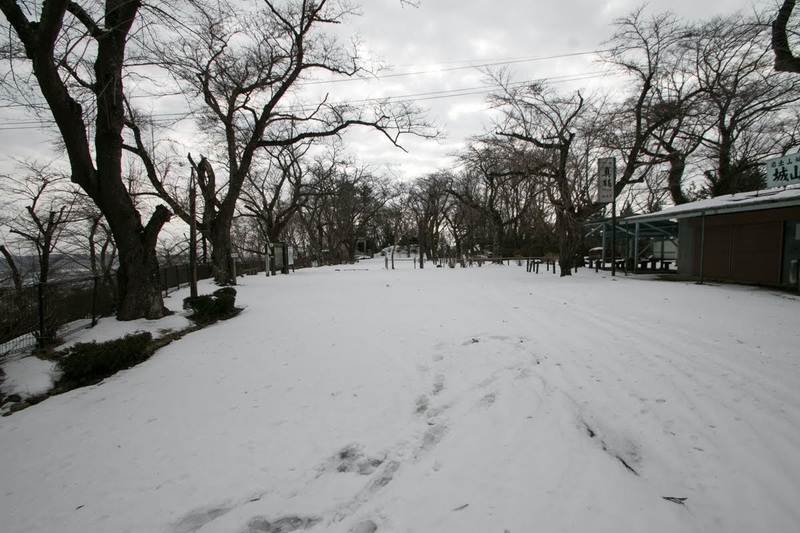 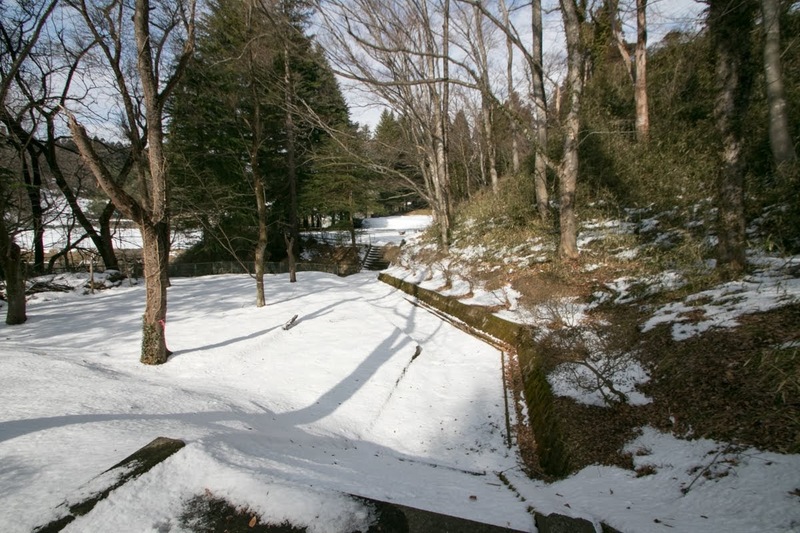 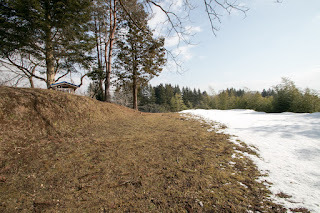 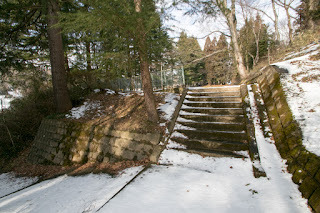 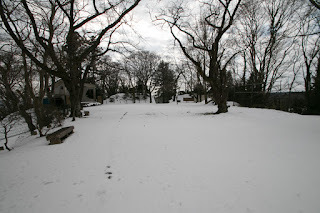 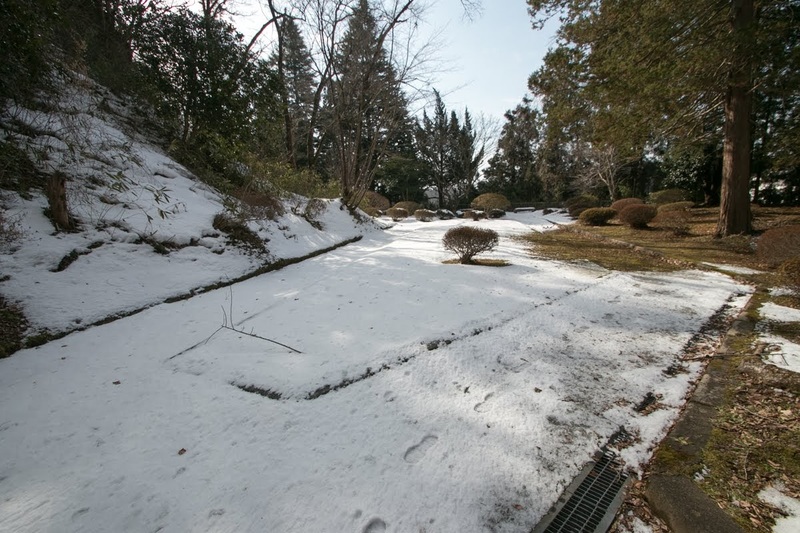 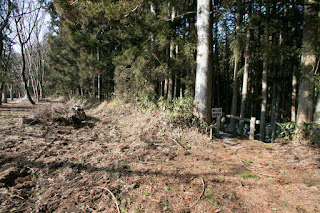 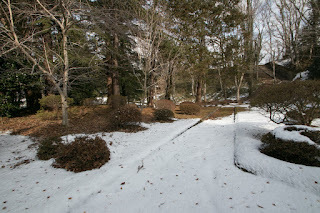 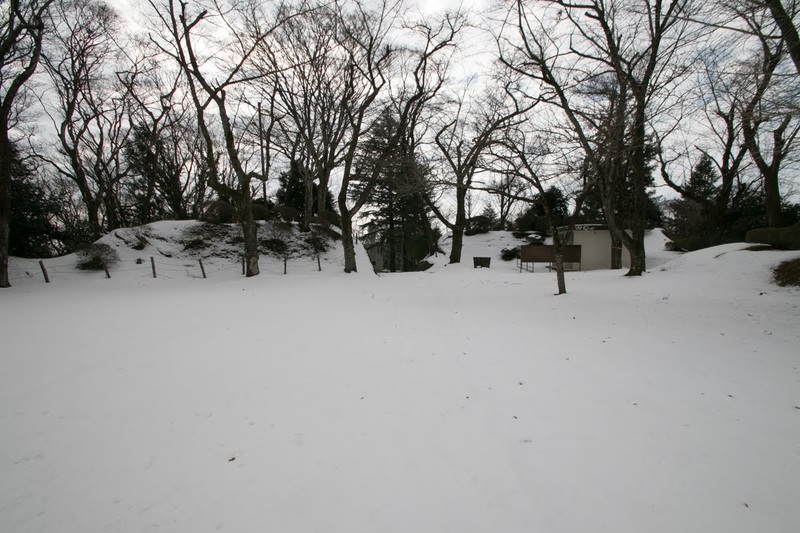 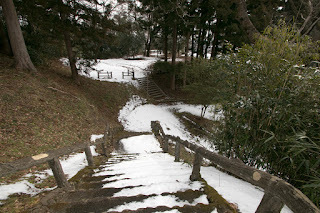 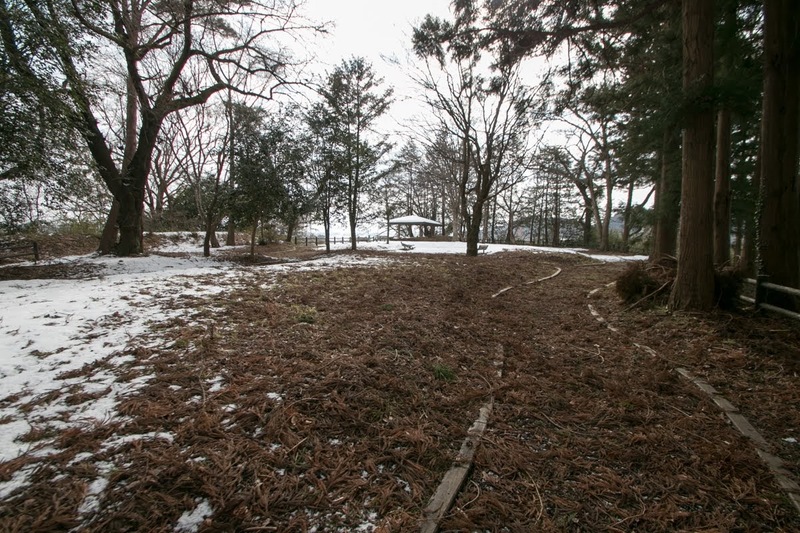 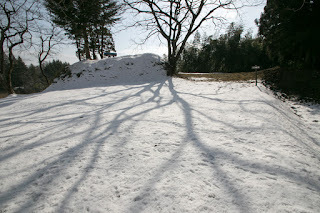 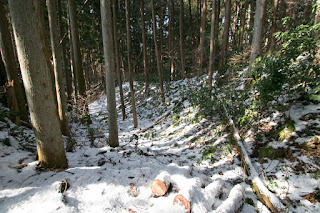 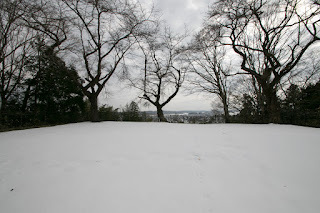 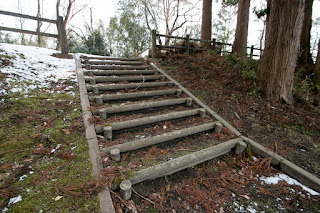 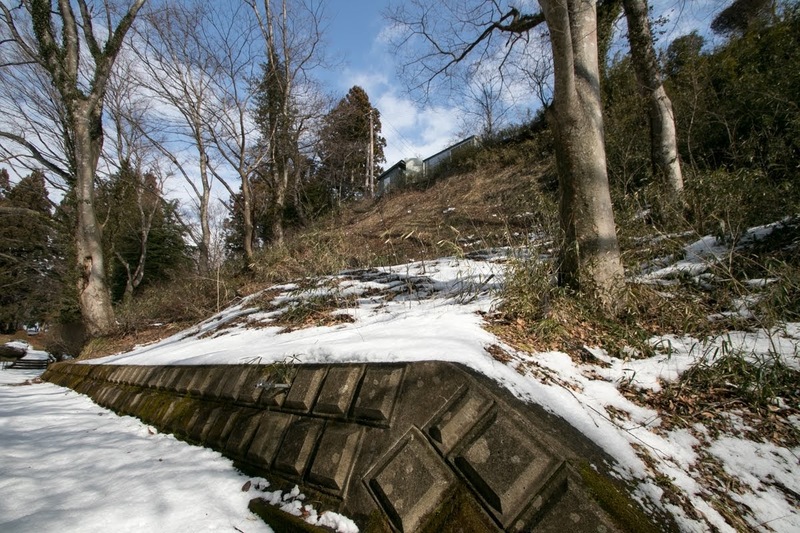 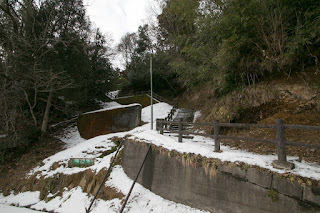 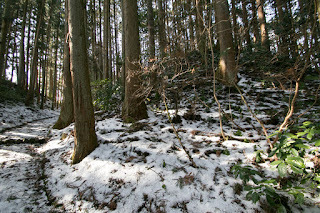 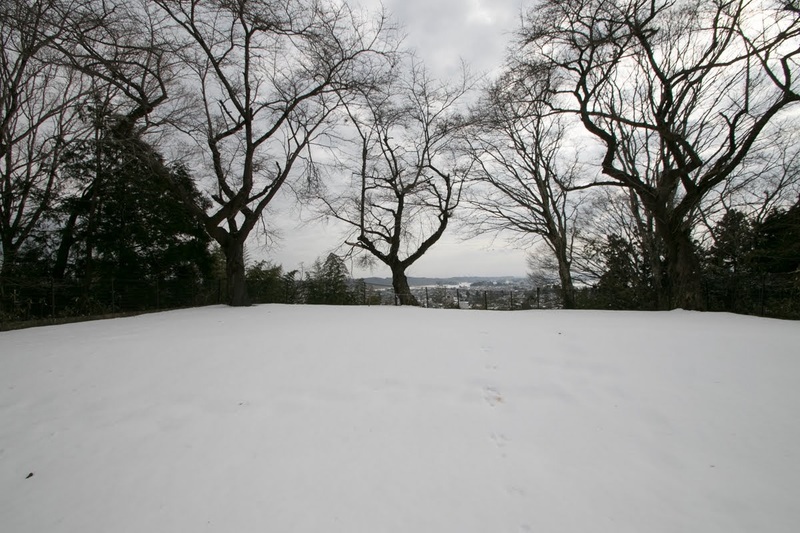 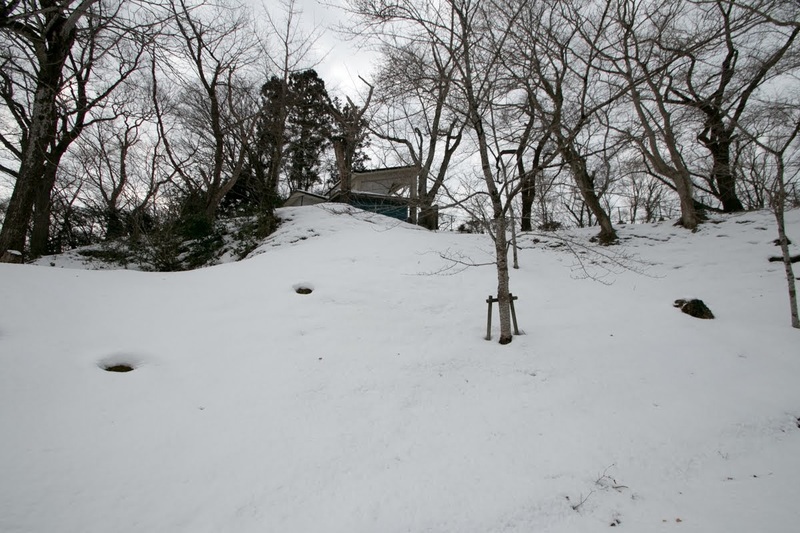 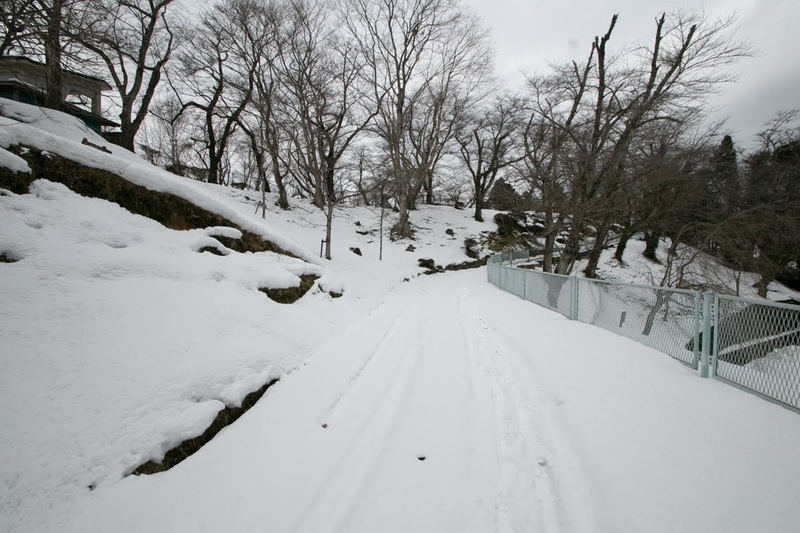 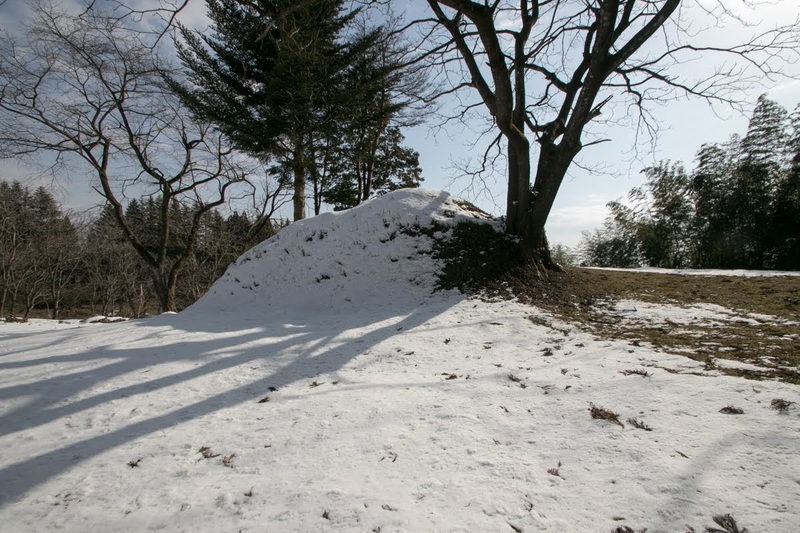 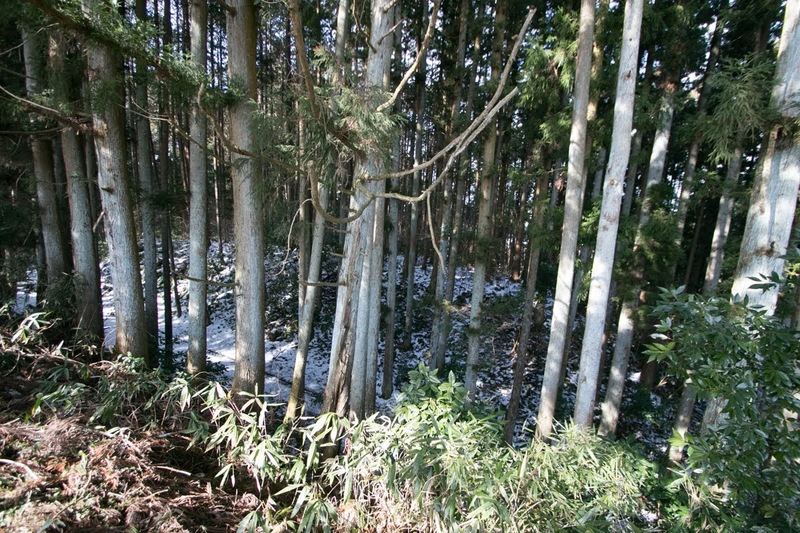 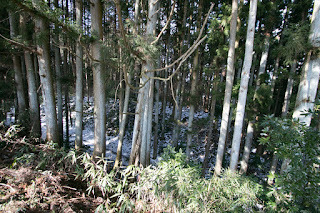 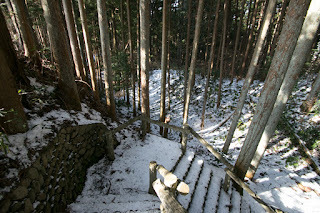 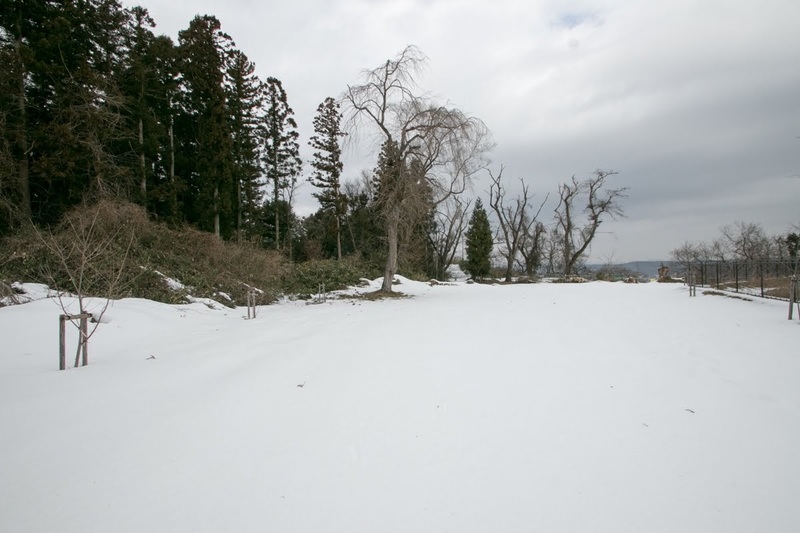 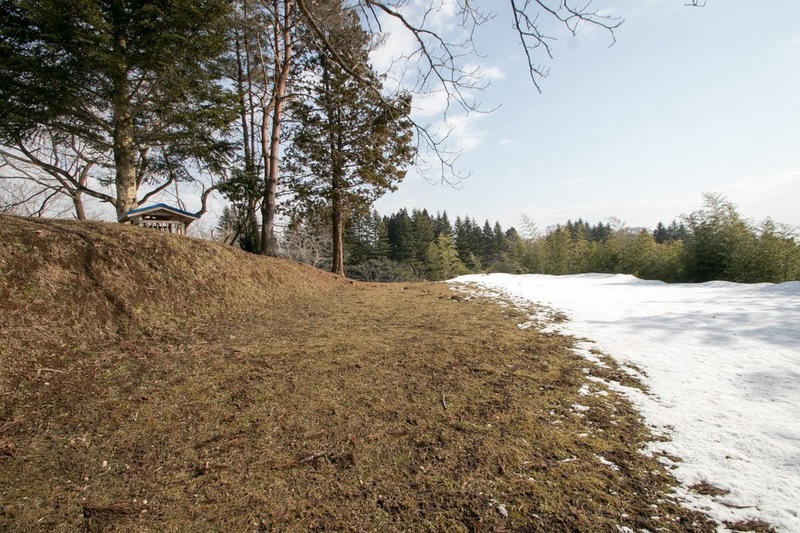 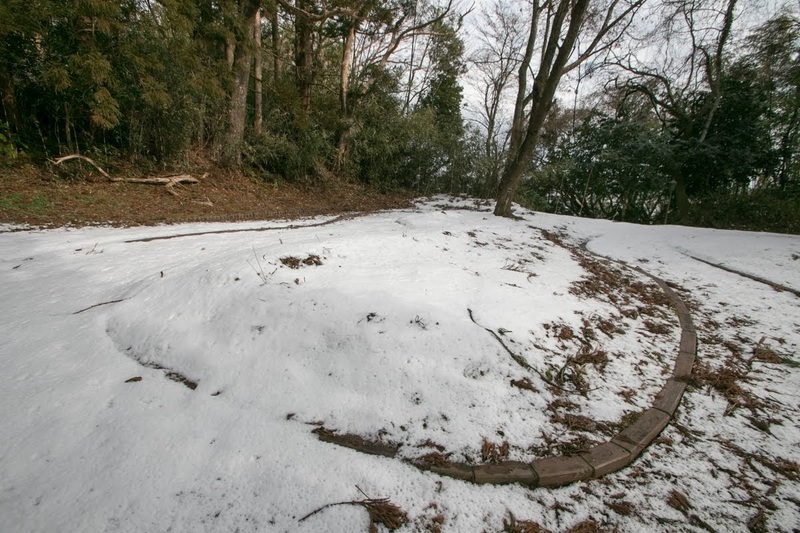 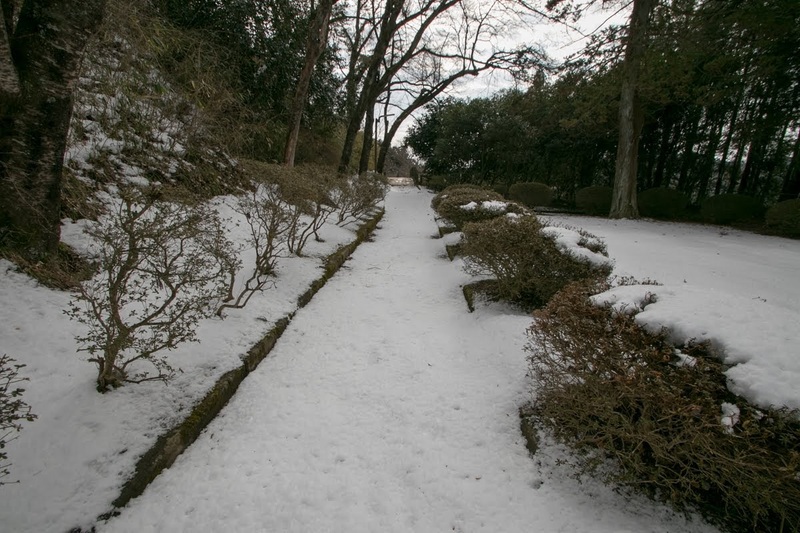 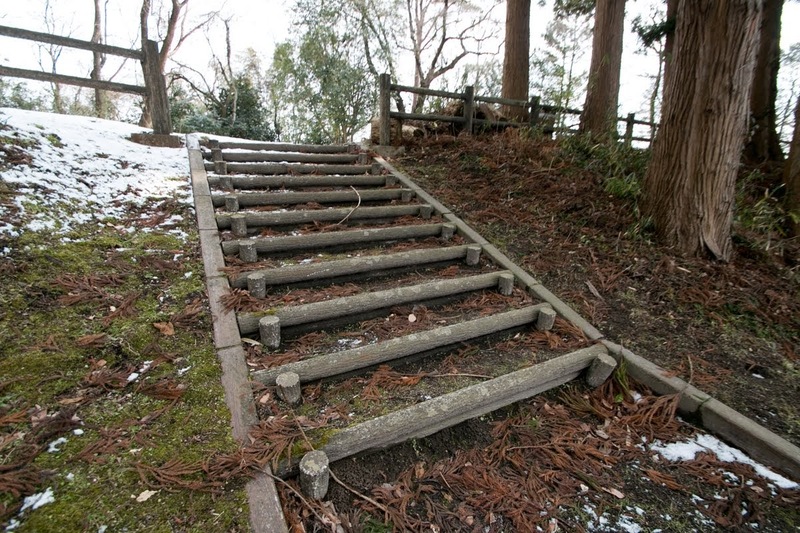 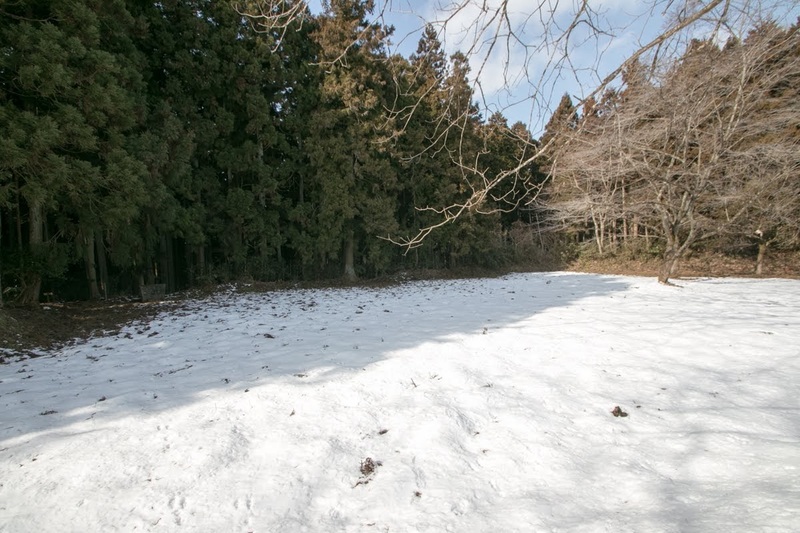 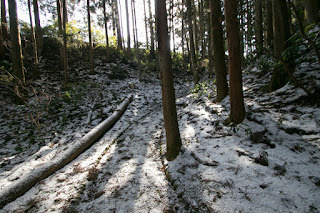 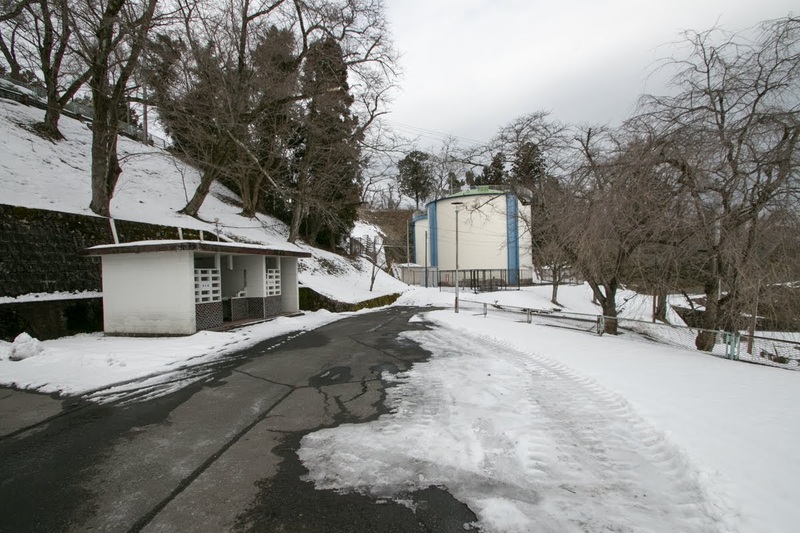 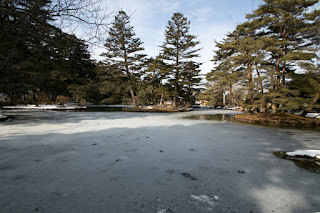 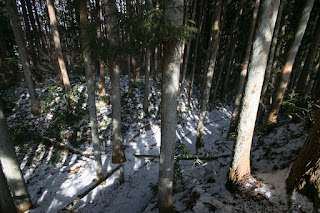 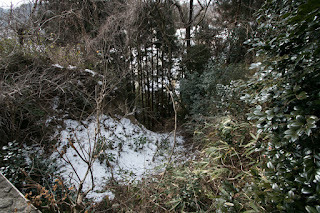 Among internal conflicts, Iwadeyama castle was often involved in the battle. 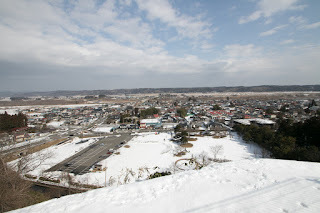 Especially Date clan which was originally the lord of Date providence at Kori Nishiyama castle (Fukushima prefecture) expanded their authority to Yonezawa basin, south part of Miyagi prefecture and middle part of Fukushima prefecture then became the strongest lord in Tohoku region by 1500. 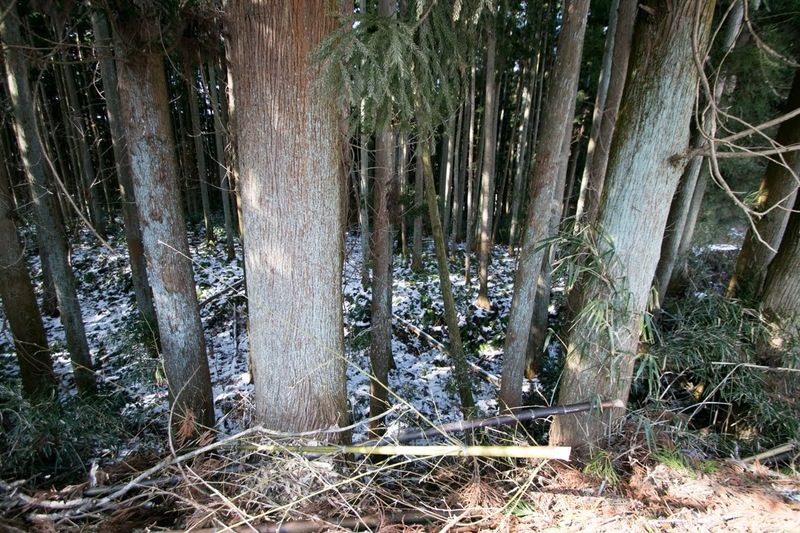 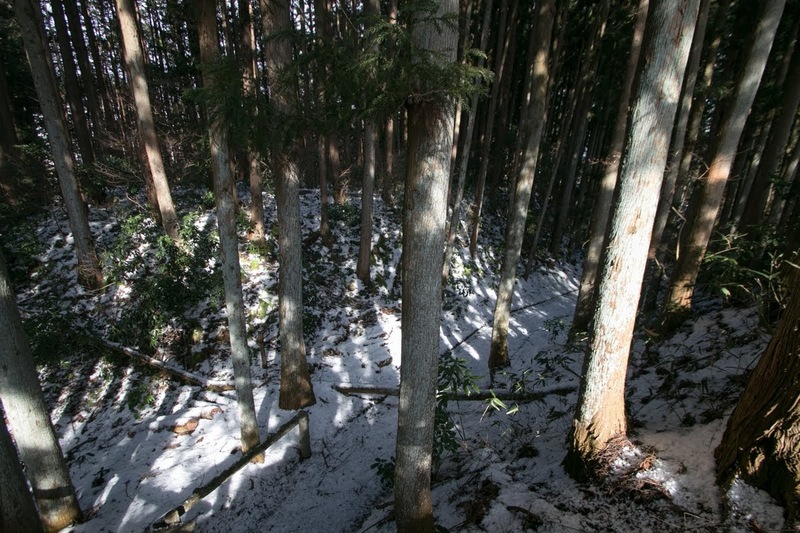 To settle its internal conflict, Osaki clan asked assistance to Date clan, then was strongly affected by Date clan. 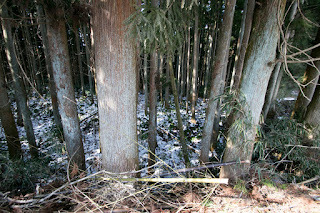 But on the other hand several retainer opposed it, and this also became the source of internal conflict. 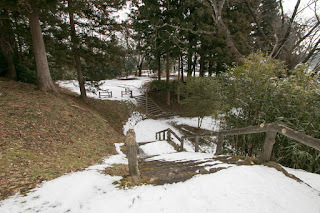 In 1588, internal conflict of Osaki clan between Date supporters and anti Date lords occurred again. 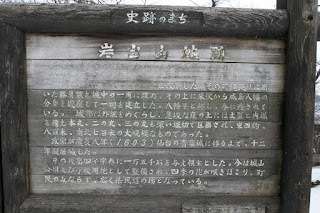 Yoshitsugu Ujiie (?-1591), the lord of Iwadeyama castle, asked assistance to Date clan. 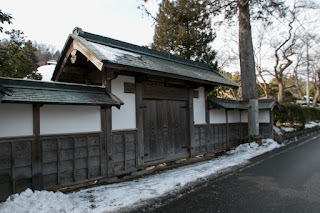 On the other hand, anti Date retainer who hoped to leave from Date clan allied with Yoshiaki Mogami (1546-1614), the lord of Yamagata castle (Yamagata prefecture) and married with the person of Osaki clan, even though an uncle of Masamune Date (1567-1636), the leader of Date clan but did not welcome expansion of Date clan. 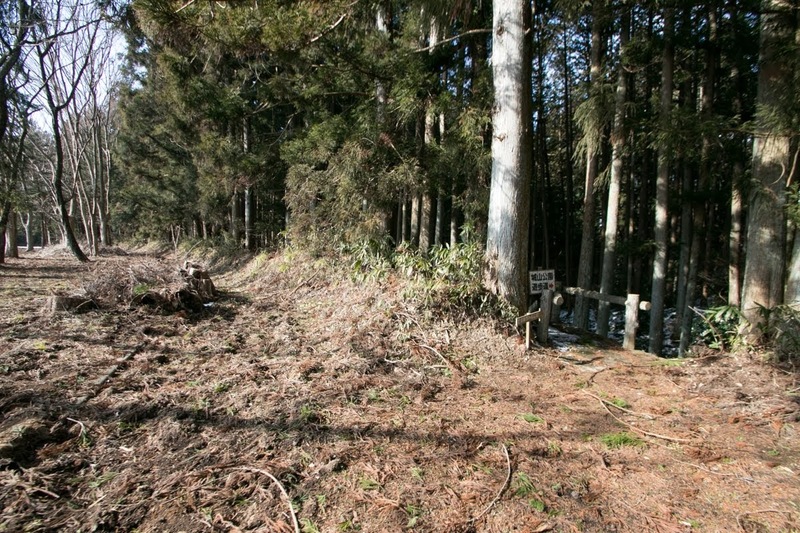 Both army collided at the south part of Osaki plain. 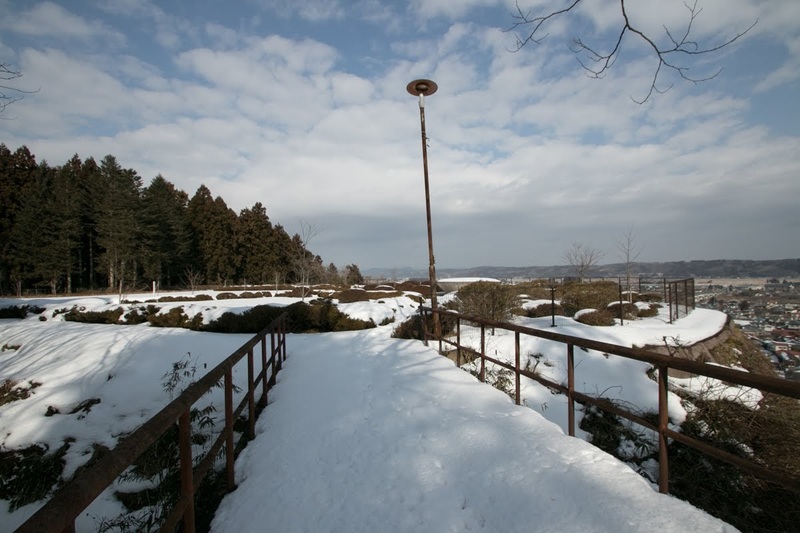 At first Date army had larger army pushed Osaki army, but because of bad weather and change of Kurokawa clan to Osaki army, Date army suffered severe defeat. 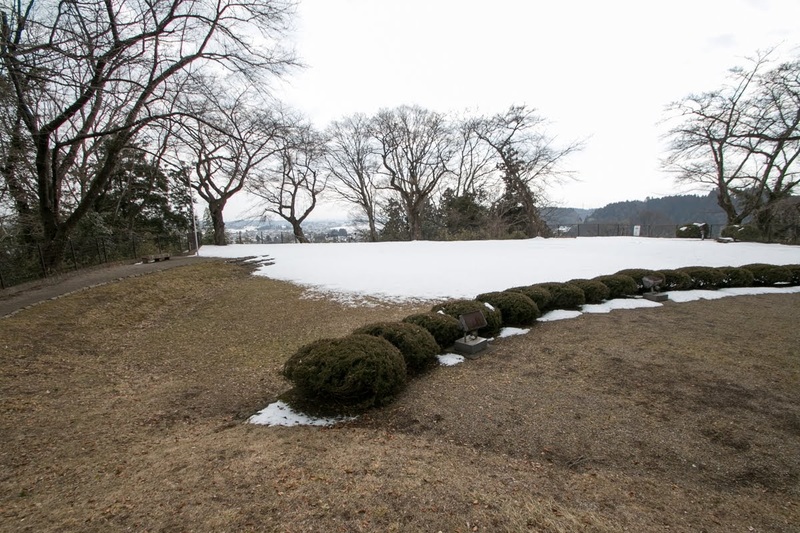 At this battle of Osaki, Osaki clan once rejected Date clan, but could not resist any more then subordinated to Date clan again. 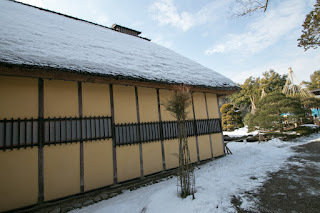 In 1590. 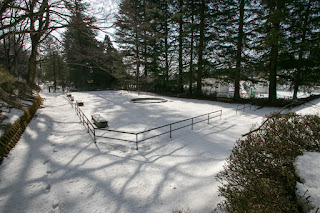 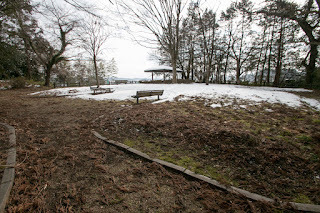 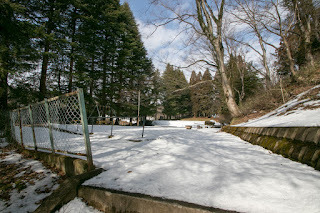 Masamune Date visited at the camp of central ruler Hideyoshi Toyotomi (1537-1598) who siege Odawara castle (Kanagawa prefecture) of Hojo clan and subordinated to central authority. 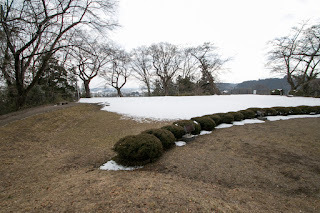 Masamune beat many surrounding strong enemies such as Ashina clan or Satake clan and expanded his territory to most part of south half of Tohoku region, and as he lost his one eye by ill, Masamune was praised as "Single-eyed dragon of Oshu region". 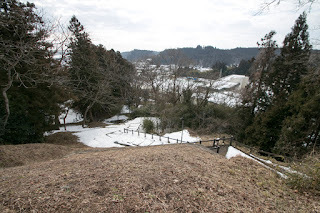 But situation of Japan had already fixed by Hideyoshi, and arrival of Masamune was too late. 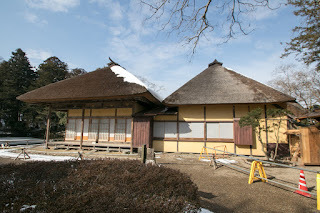 At this surrender of Masamune, because of internal conflict and subordination to Date clan, Osaki clan did not send envoy to Hideyoshi this time. 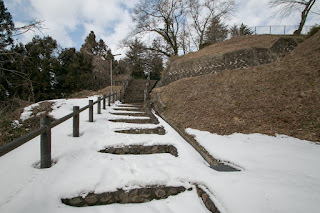 But Hideyoshi blamed this and expelled Osaki clan. Osaki clan ended its history as a warlord, then Ujiie clan served to Masamune. 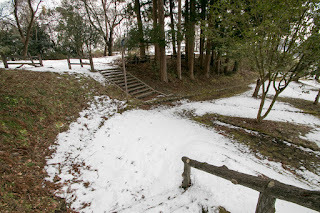 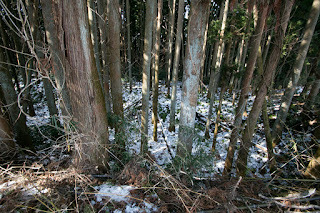 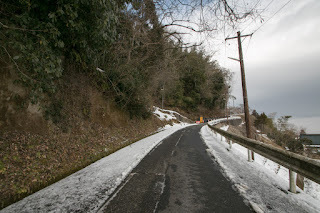 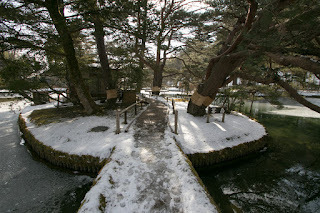 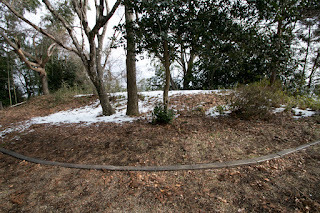 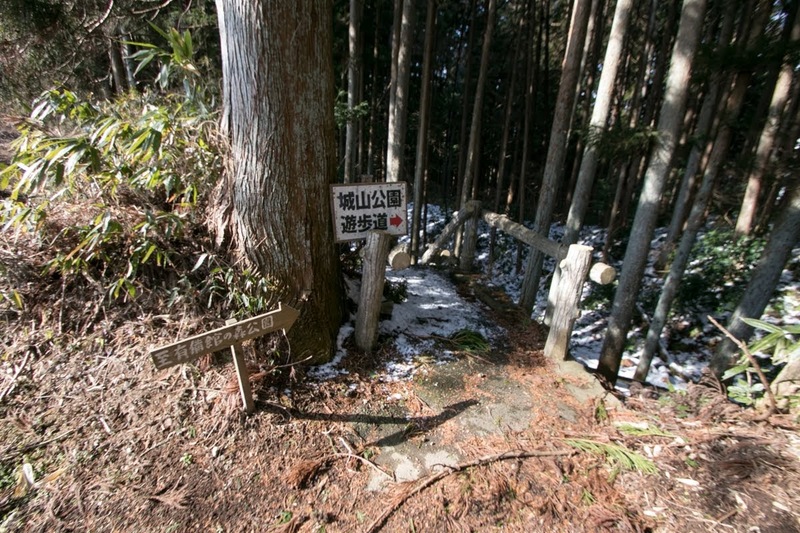 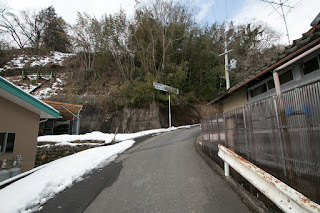 But at that year, former retainers of Osaki clan and Kasai clan, a rival of Osaki clan and also confiscated its territory by Hideyoshi, revolted to Kimura clan appointed by Hideyoshi as a lord At first former retainer of Ujiie clan captured Iwadeyama castle, and rebellion spread into whole part of former Osaki and Kasai territory. 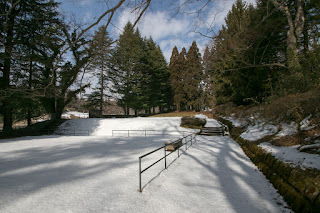 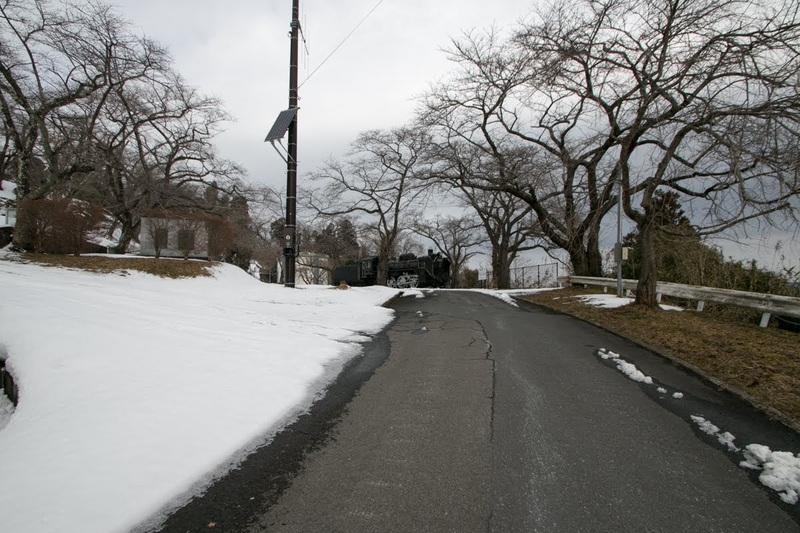 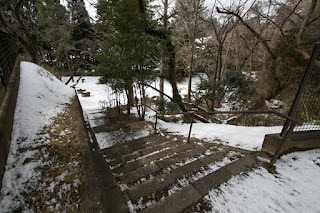 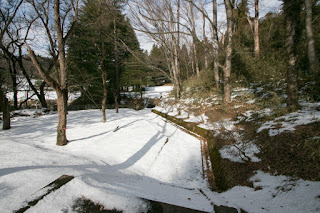 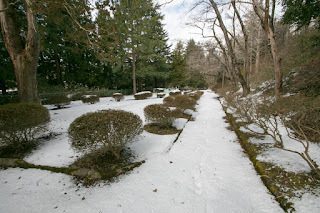 Rebel army occupied Nyu castle which was the main base of Osaki clan or Teraike castle of former Kasai clan easily. It is said that this rebellion was secretly supported by Masamune who lost Aizu basin by Hideyoshi, to expel Kimura clan and capture former Kasai and Osaki territory as a reward for suppression. 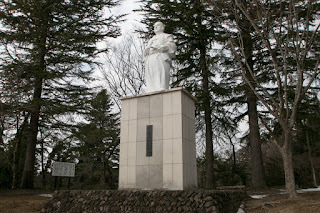 Under the order of Hideyoshi, Masamune and Ujisato Gamo (1556-1595) who was the lord of Aizu Wakamatsu castle (Fukushima prefecture) cooperatively suppressed this rebellion by the summer of next year. 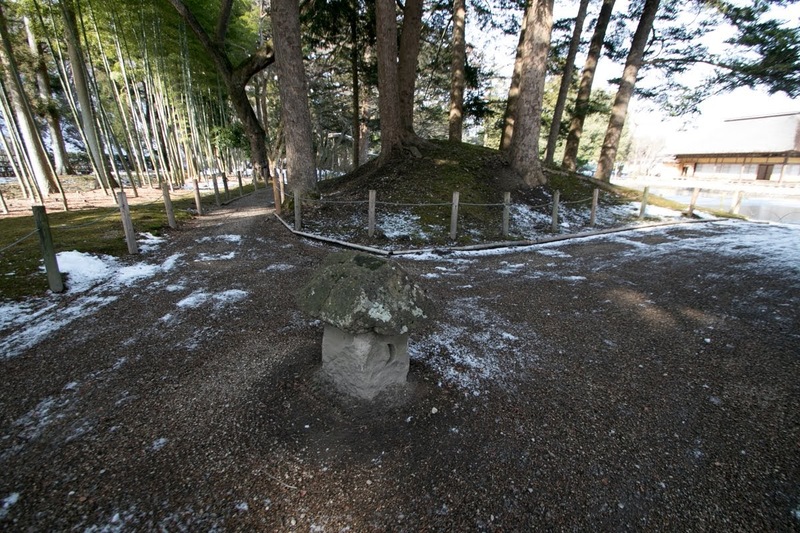 At the time of suppression, to conceal his plot, Masamune killed leaders of rebellion. But this plot was known by Hideyoshi, then after the settlement, Masamune was ordered to leave his originally territory such as Date area or Yonezawa basin and his main base Yonezawa castle (Yamagata prefecture), then move to former Osaki and Kasai territory. 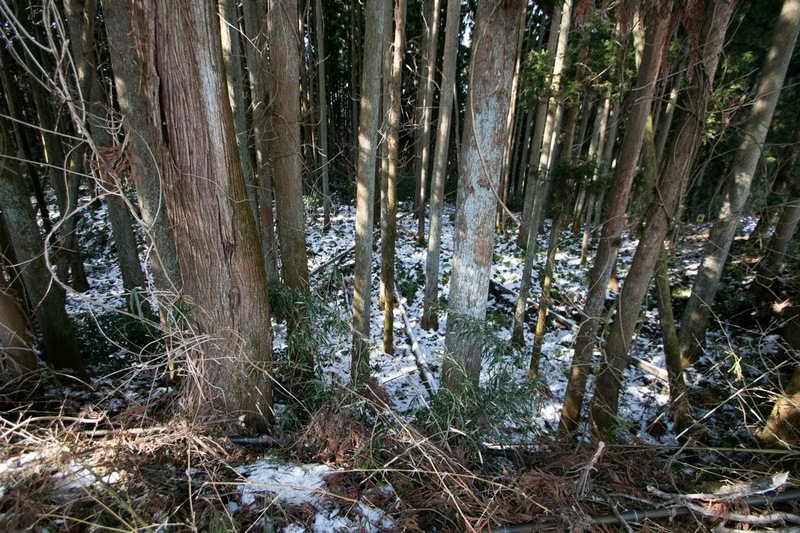 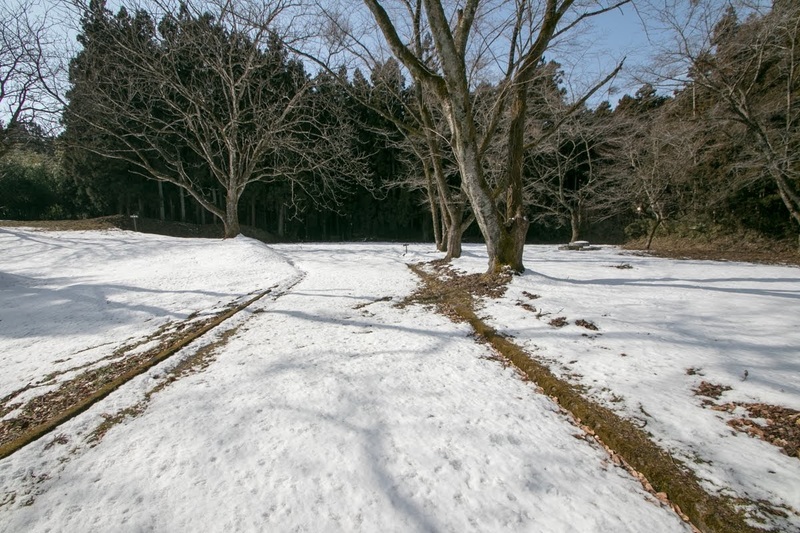 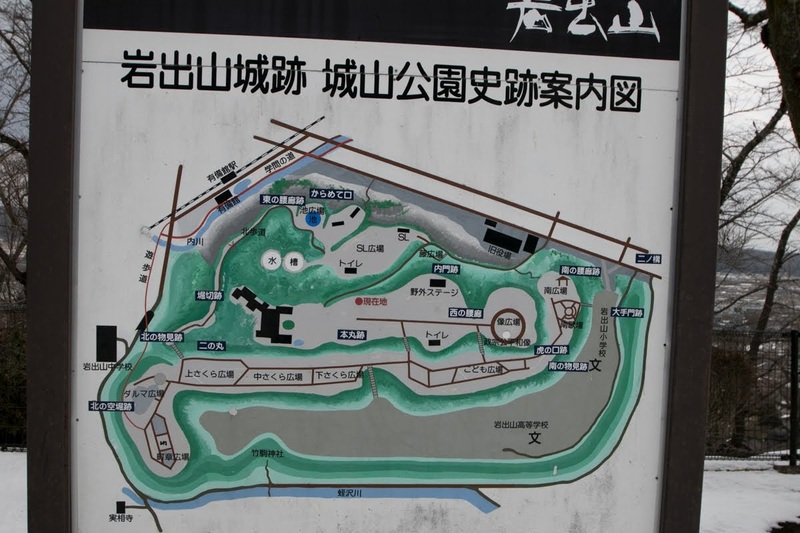 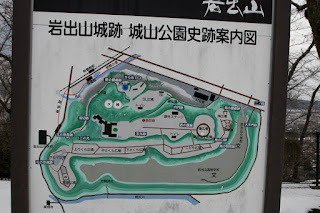 These areas were severely damaged by rebellion, and Masamune had to take responsibility of his plot. 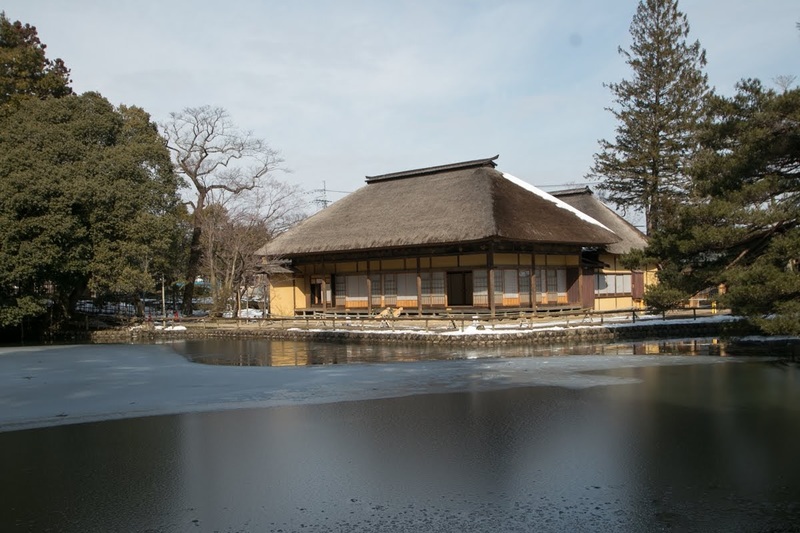 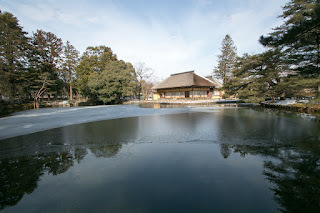 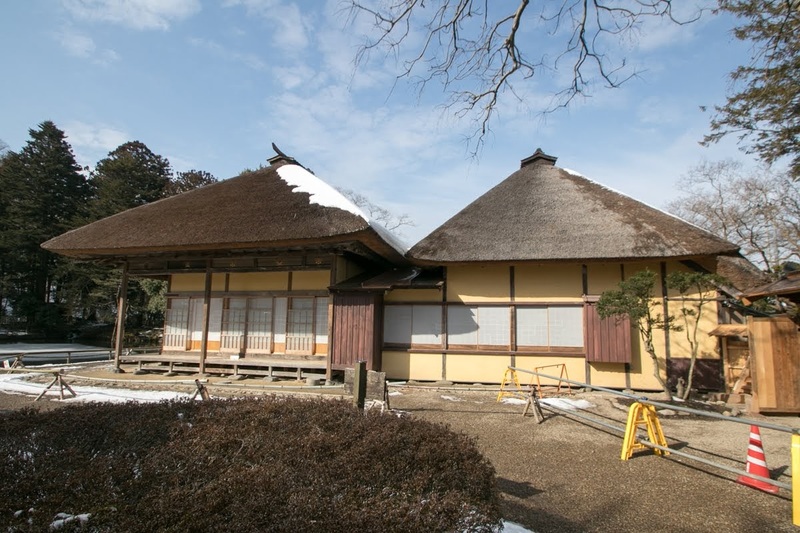 Under post-war process, Ieyasu Tokugawa (1543-1616), the largest lord of Toyotomi government and in charge of Eastern Japan, reformed Iwadeyama castle and handed it over to Masamune as a residence. 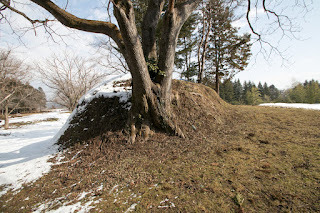 Considering unstable situation after the rebellion and easy fall of Nyu castle or Teraike castle, secure castle was necessary to protect the authority of central government. 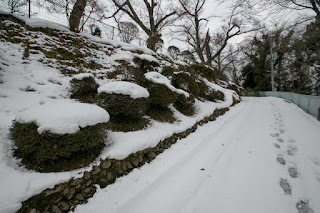 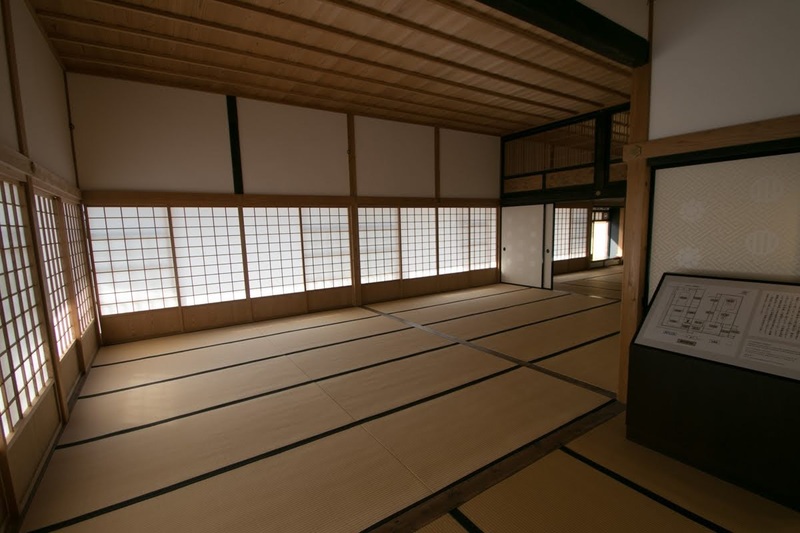 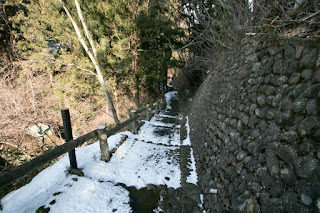 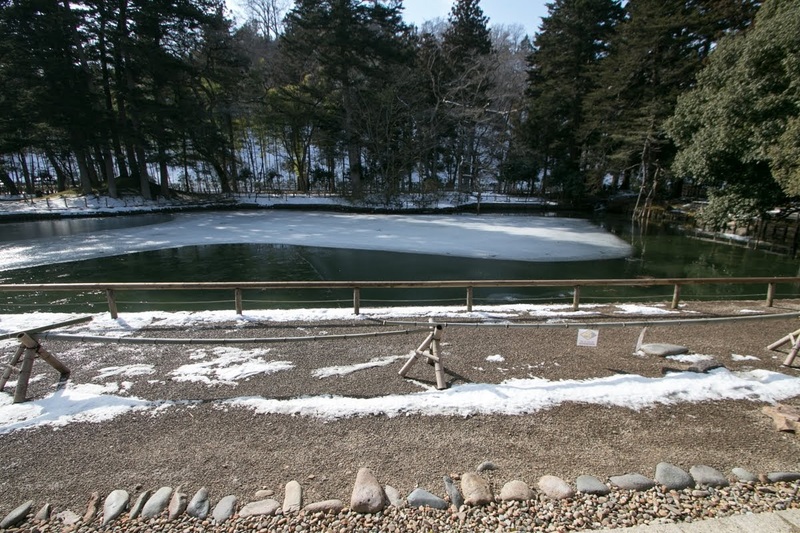 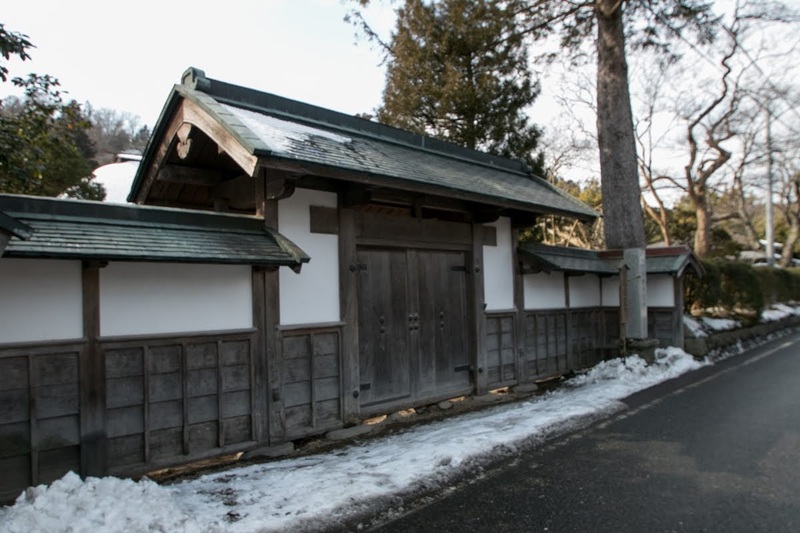 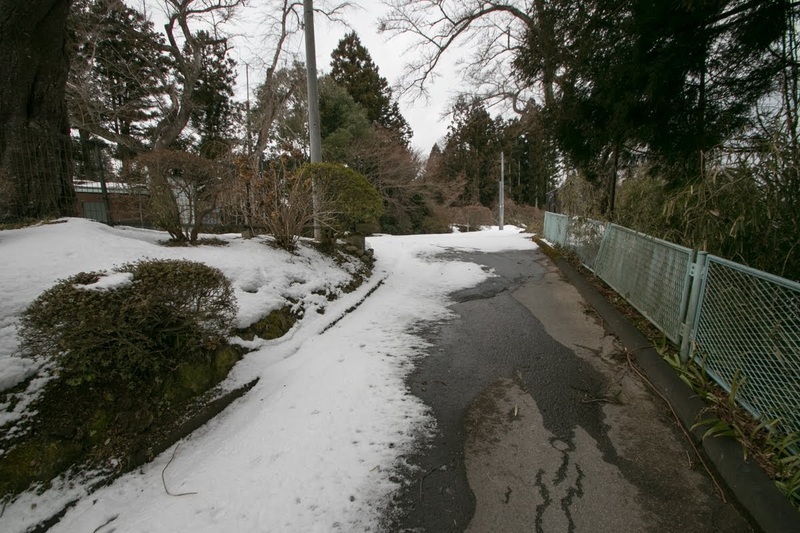 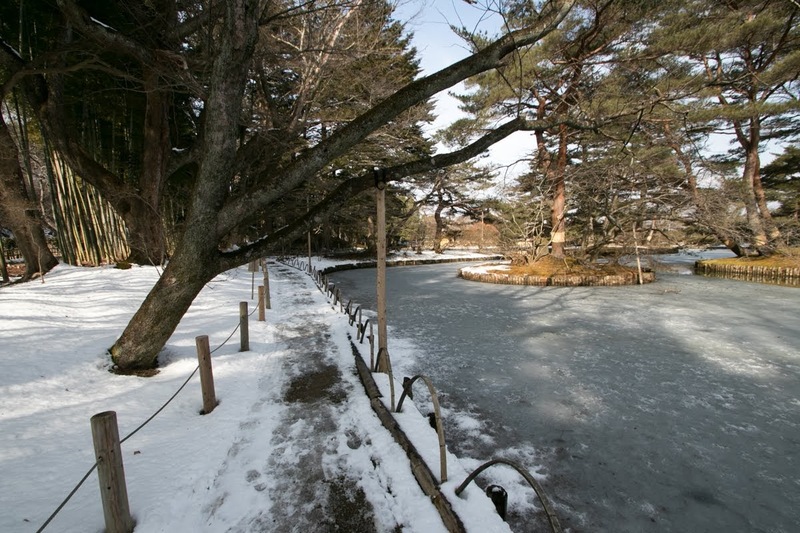 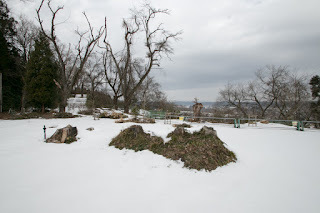 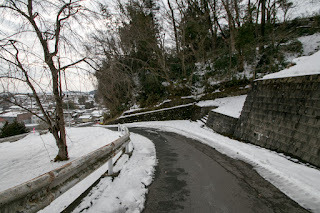 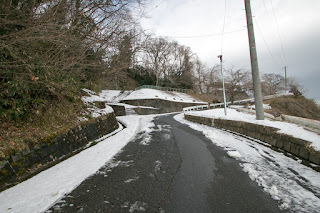 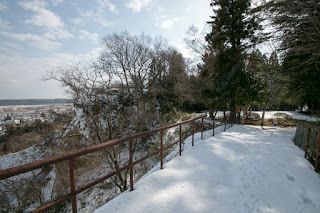 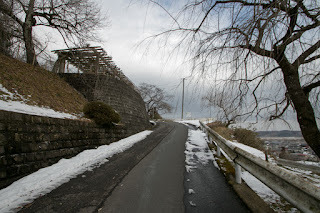 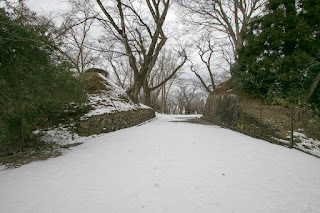 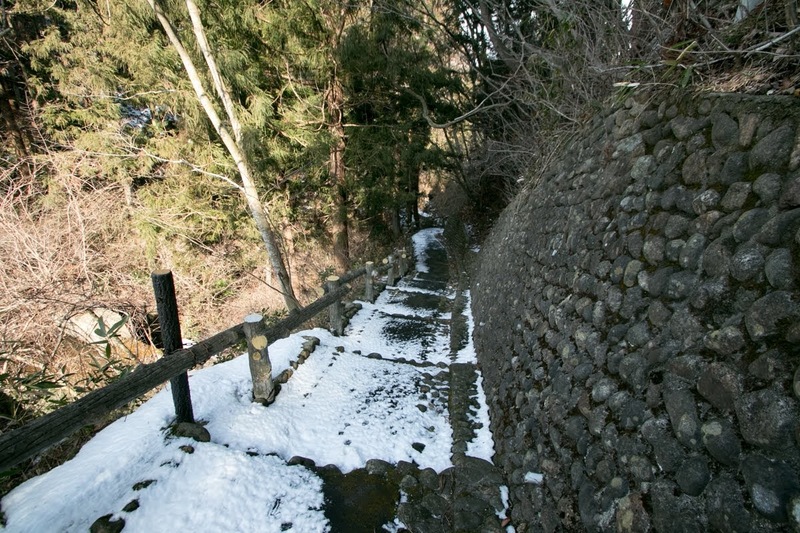 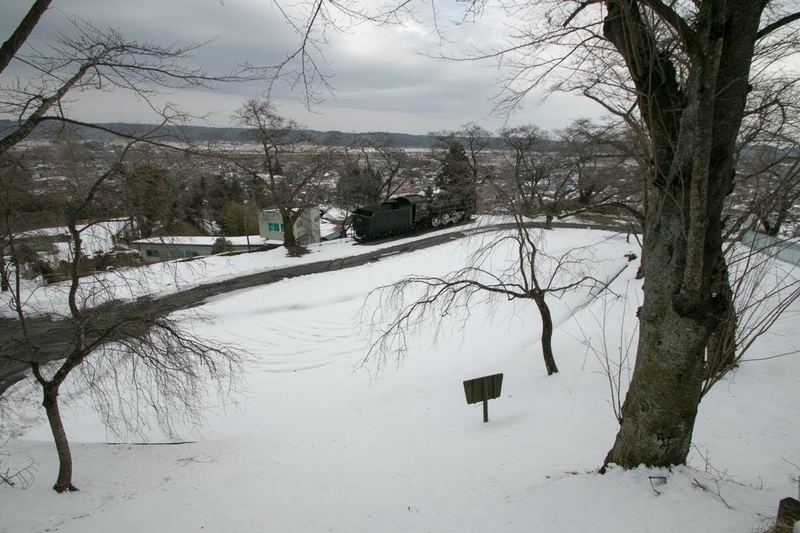 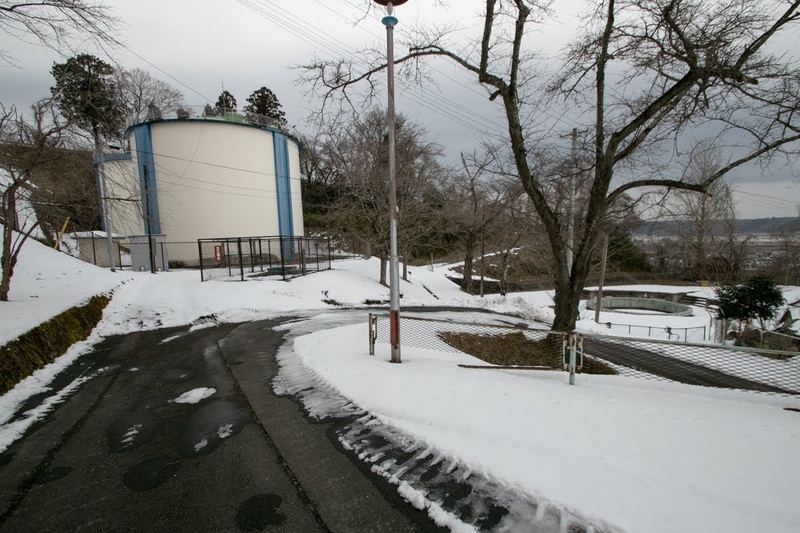 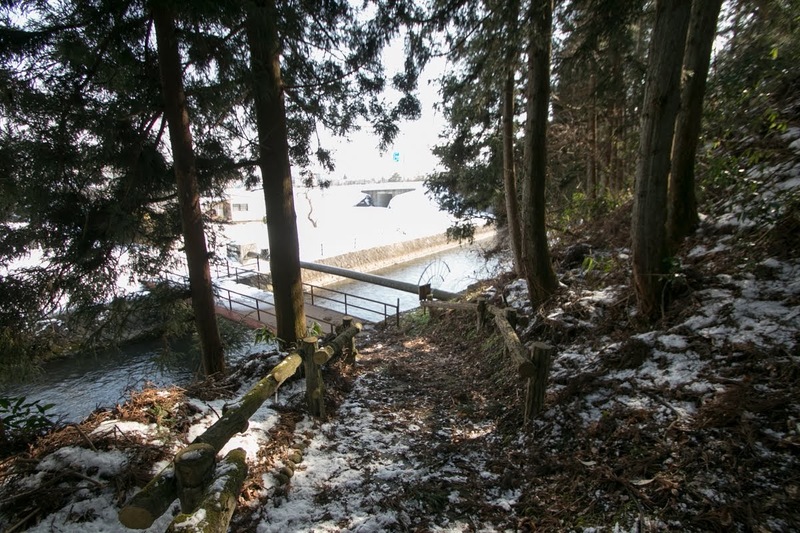 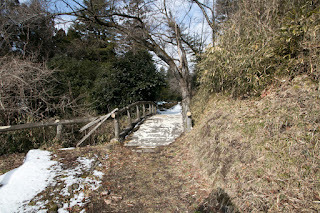 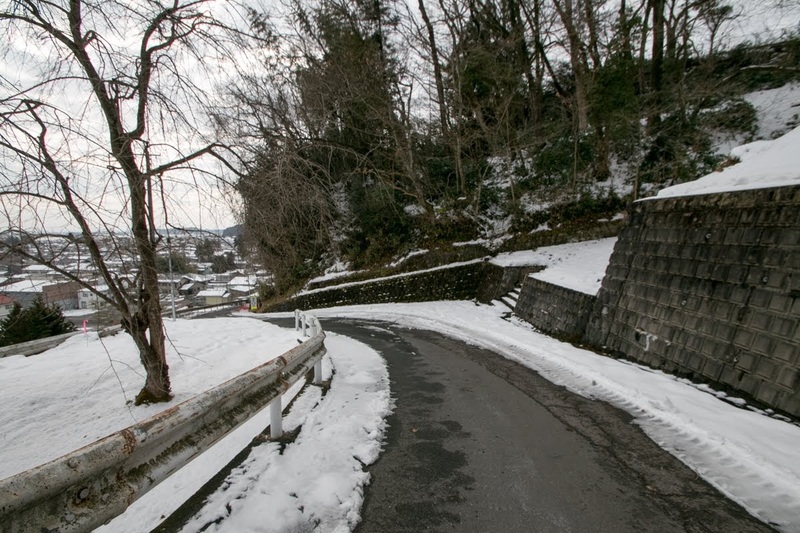 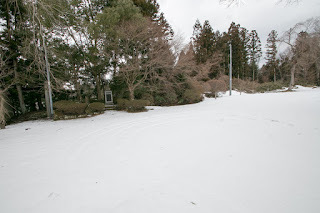 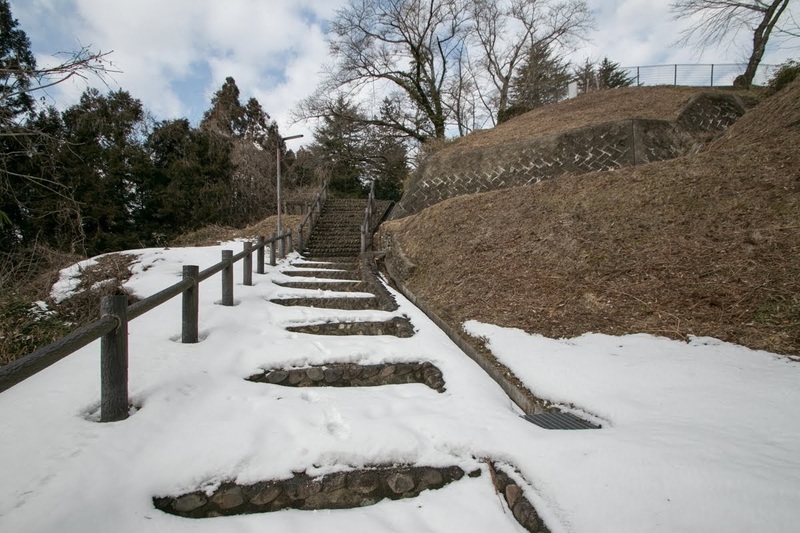 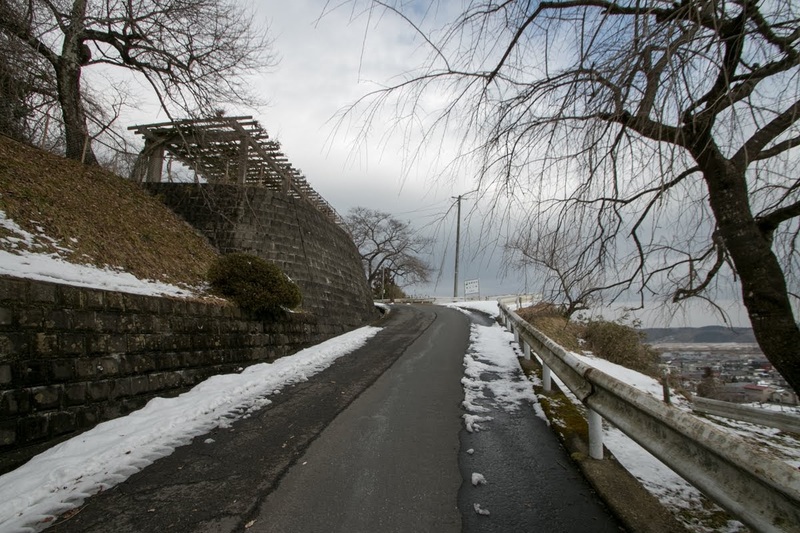 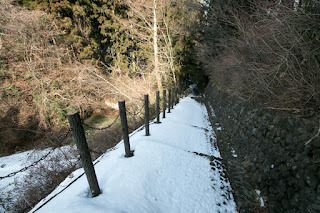 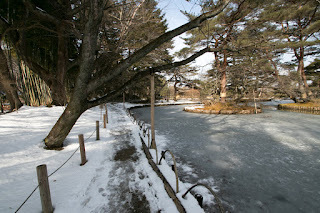 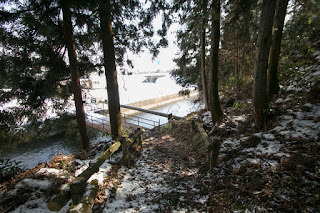 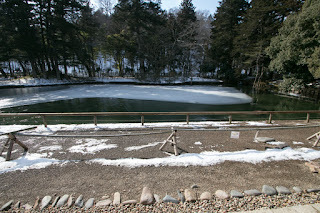 Since then, Masamune moved from Yonezawa castle to Iwadeyama castle and used it as his main base over 10 years. 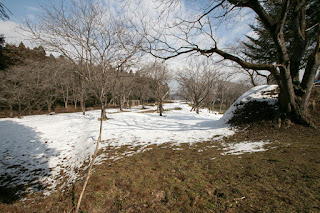 Iwadeyama castle is built utilizing reverse "U" letter shaped hill, and core area of the castle is built at eastern ridge. 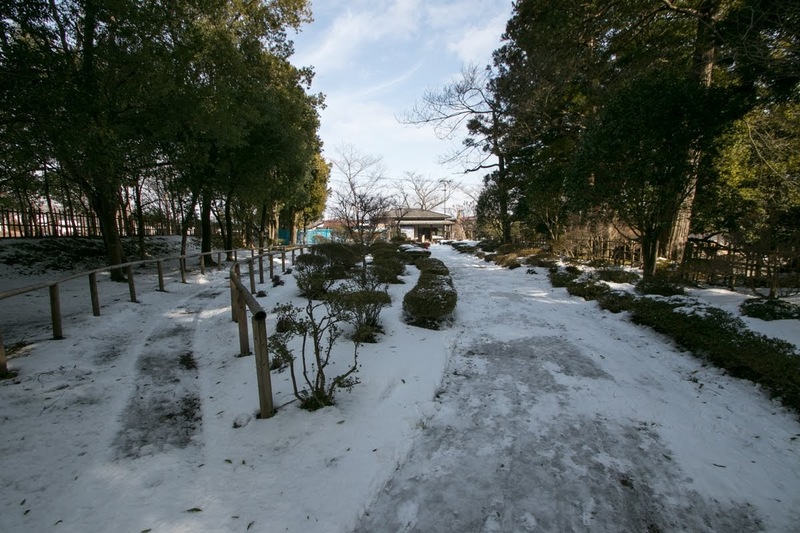 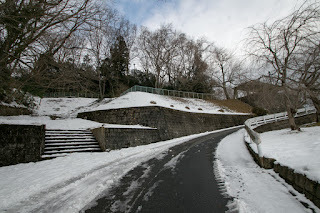 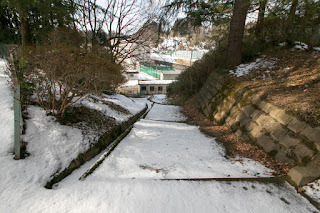 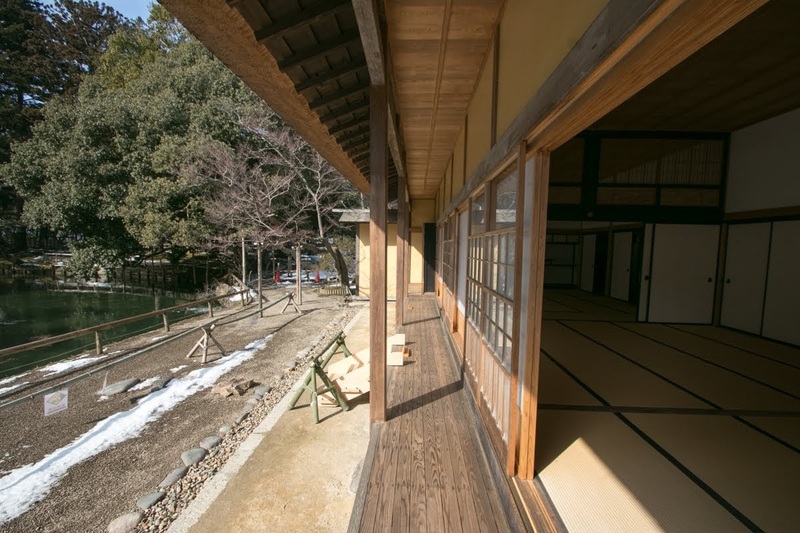 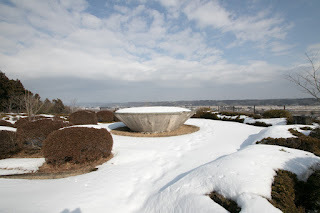 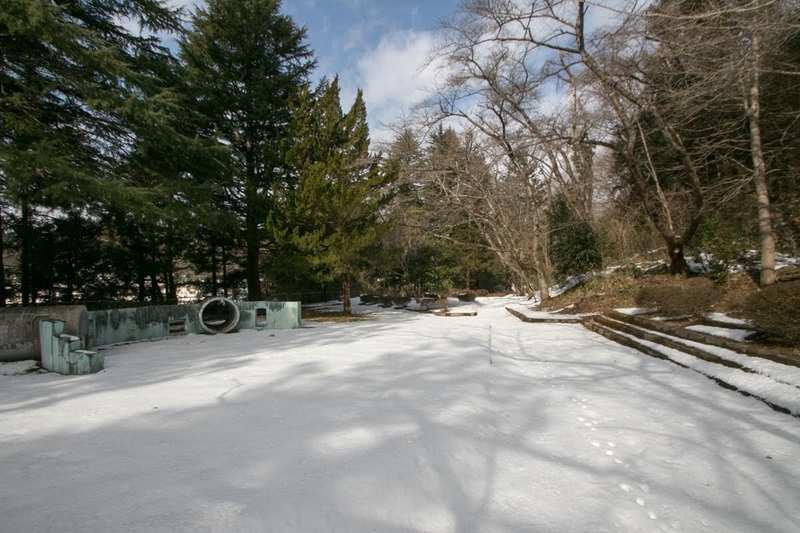 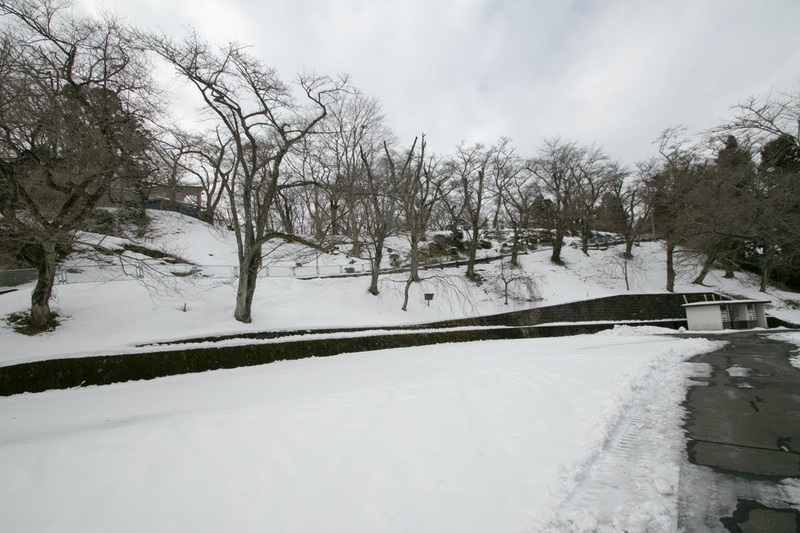 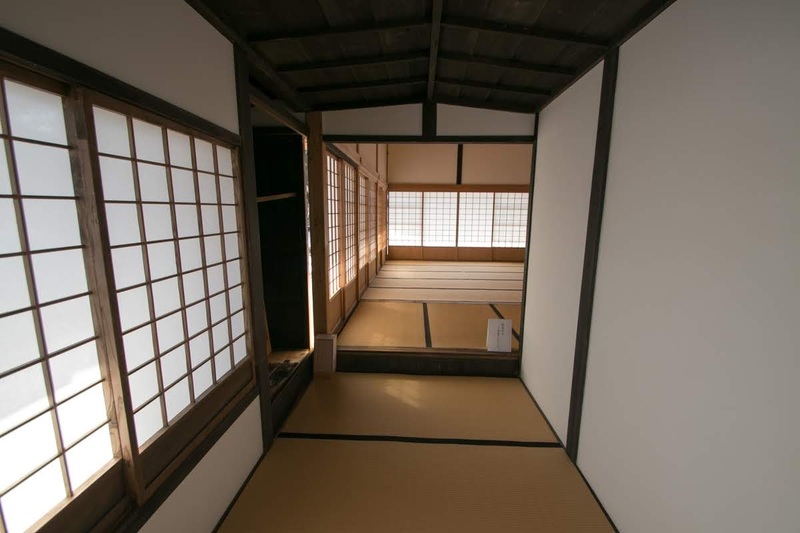 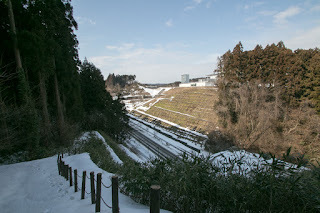 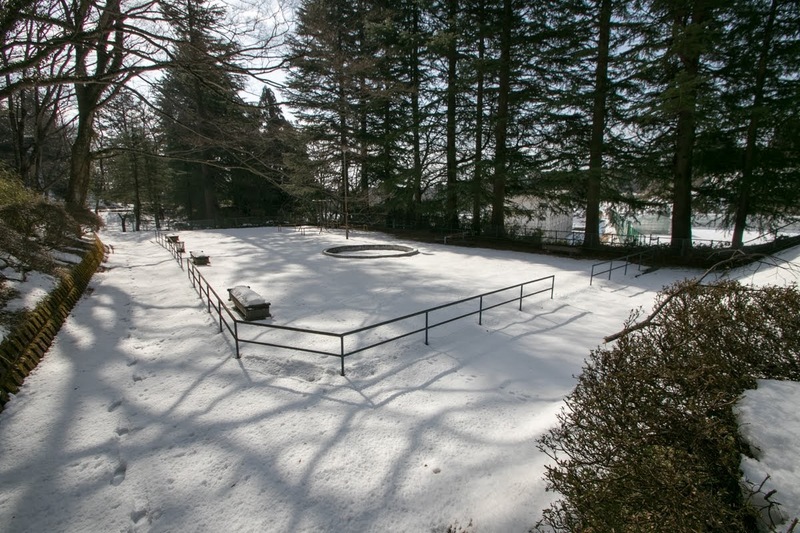 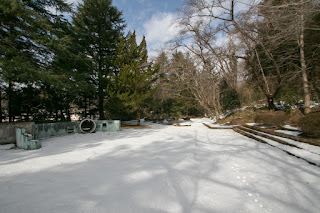 Central area is a long and narrow terrace of 200 meter long and 50 meter wide, which has a round shaped attached terrace at its south where statue of Masamune Date is built. At central area there is no ruin of main tower basement, and only residence might exist at this area. At the west of central area, secondary area which is also a long and narrow area continues from south edge of the hill to the root of vertical line. 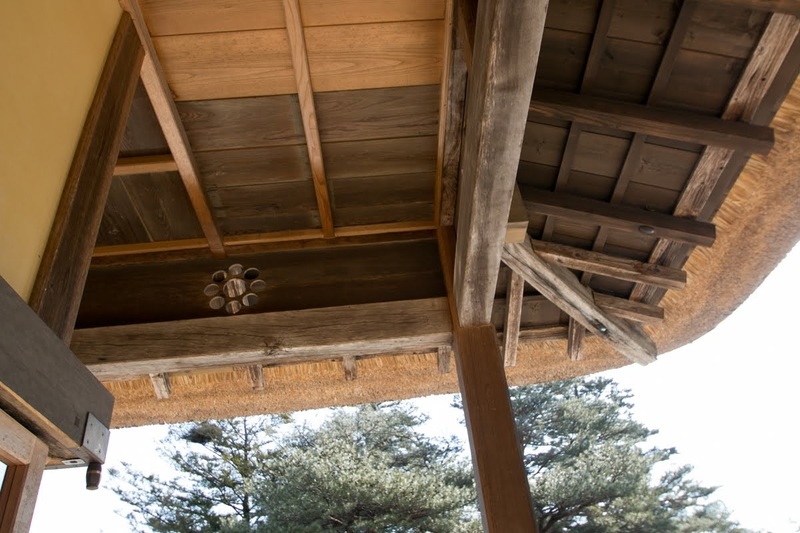 At its south edge, a masugata style clay gate is built as a main entrance of the castle. 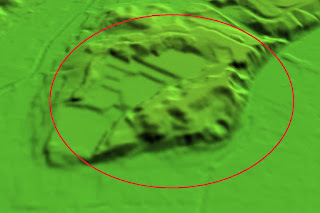 This area is separated into small pieces by height gap, but it is unclear if this is original shape or modified at the construction of park. 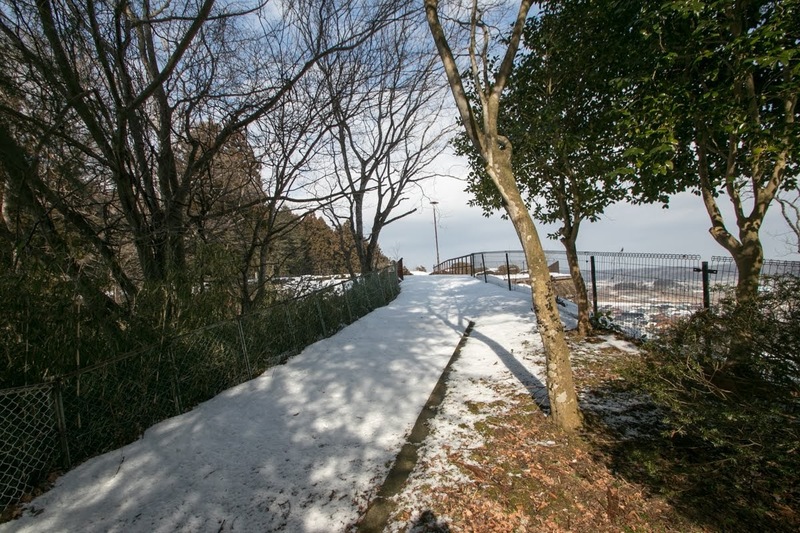 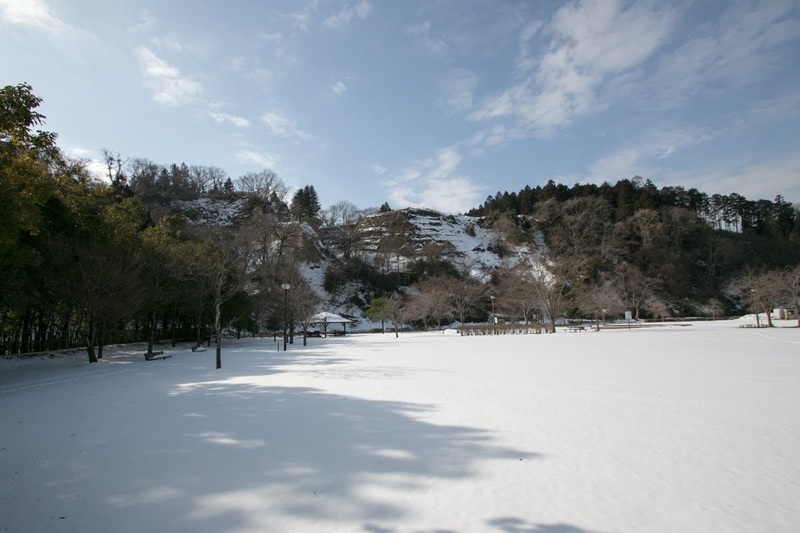 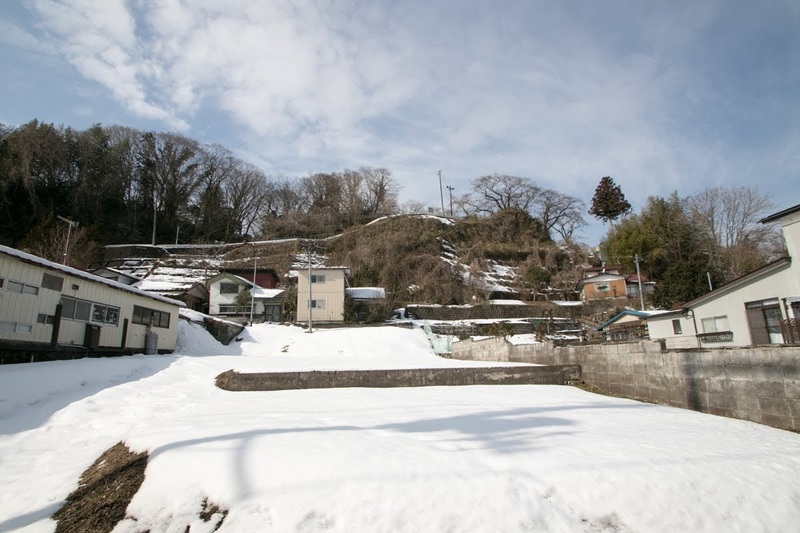 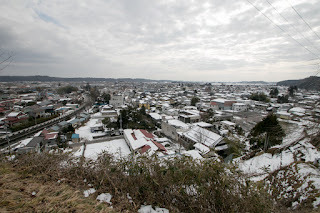 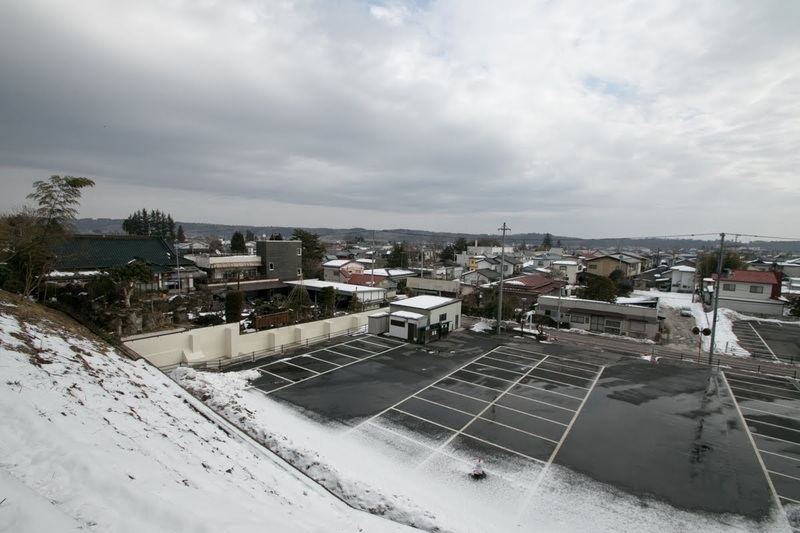 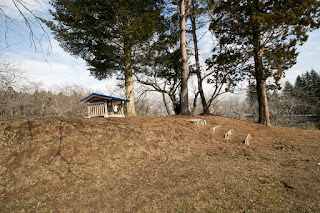 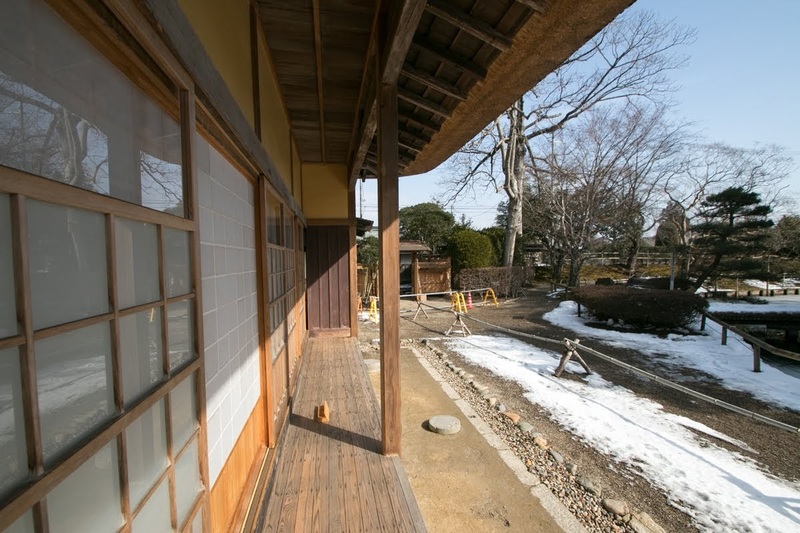 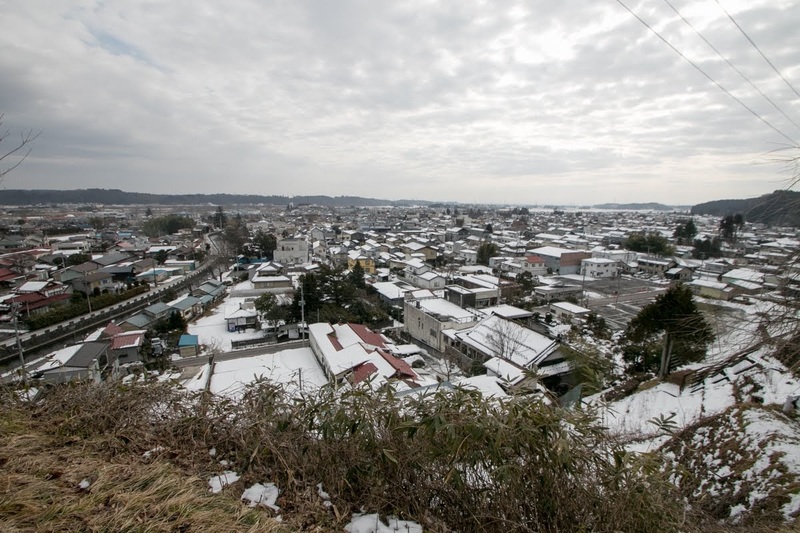 From the north to west of the hill, there is a large flat space used as outer area and small watching space named Hachimandaira protected by clay wall. Inside reverse "U" letter there is a large flat space now used as a ground of high school, and there might be a residence of Masamune. 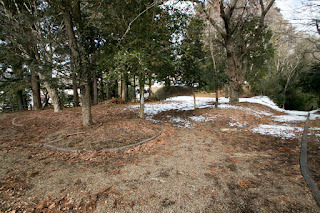 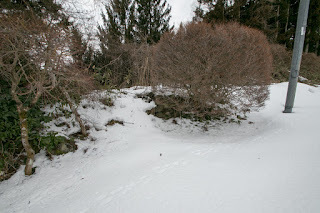 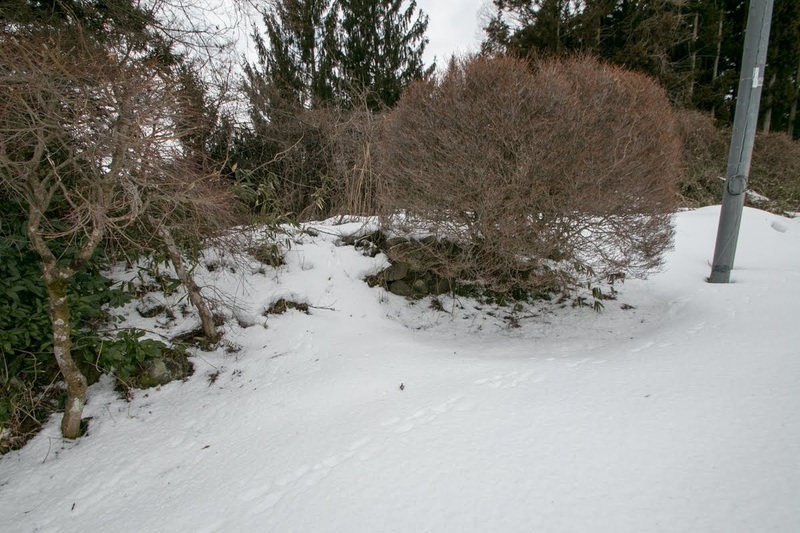 North edge of castle is separated by deep dry moat from backside mountain, and two creeks flows both side of the castle were used as inner moats. 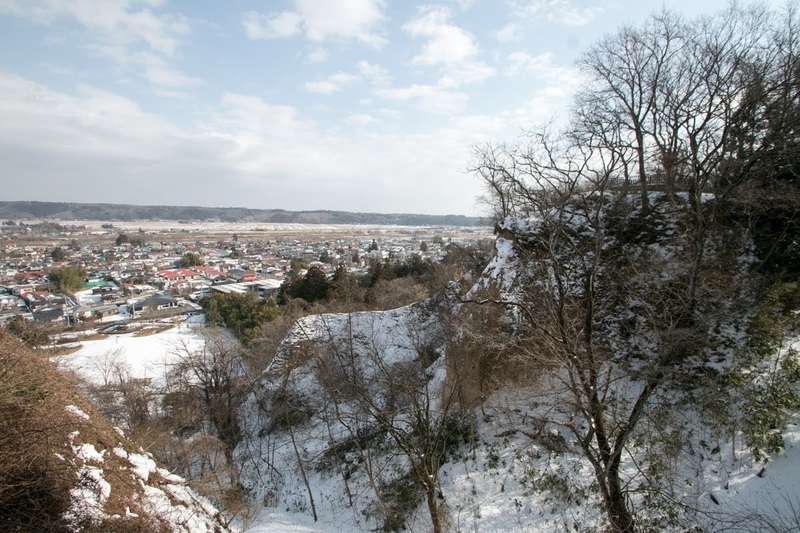 Total size of the castle is about 600 meter long and 400 meter wide. 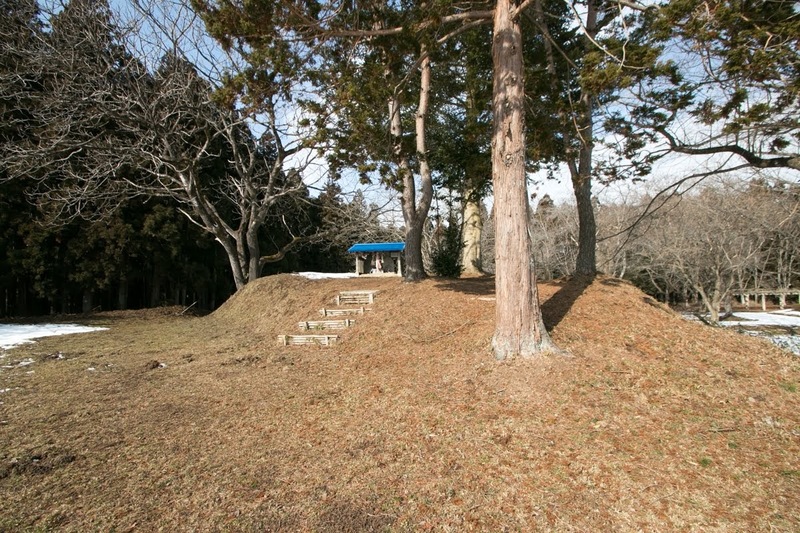 Of course it is a large castle, but might be too small to Masamune who once seized most part of south half of Tohoku region. 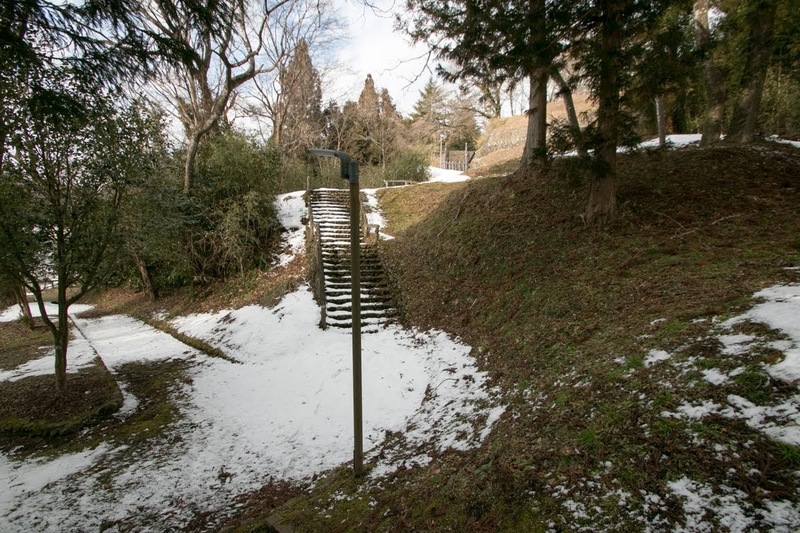 There might be no main tower and stone wall, which might be used to show authority at contemporary castle. Furthermore, being located at a small valley there is no space to build large castle town. 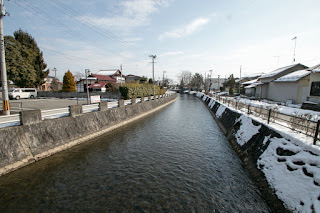 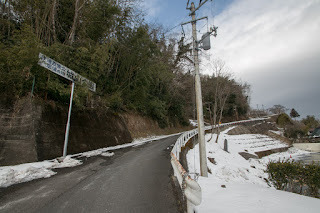 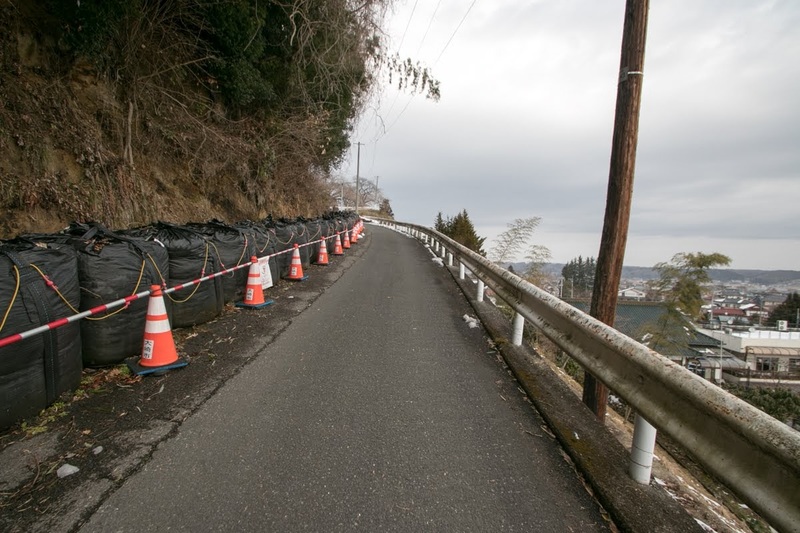 It was far apart from Oshu Kaido road which was a arterial road of Tohoku region, Kitagami-gawa river or Ishinomaki port. thus it was difficult to develop economy at this place. 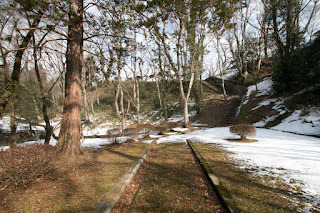 Fearing the trouble Hideyoshi did not ruin Masamune, but drove to distant area. It might be a prison for Masamune, who was feared as single-eyed dragon of Oshu region. 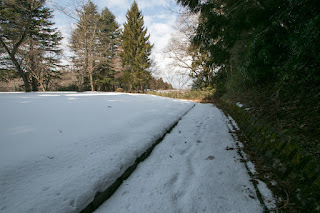 Since then, Masamune had to spend days of perseverance. 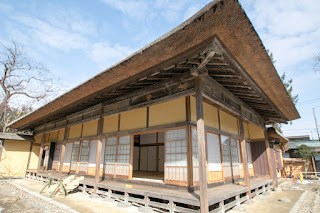 Because of past violation of no internal war order by Hideyoshi and plots, Hideyoshi did not trust Masamune and sometimes doubted his rebellion. 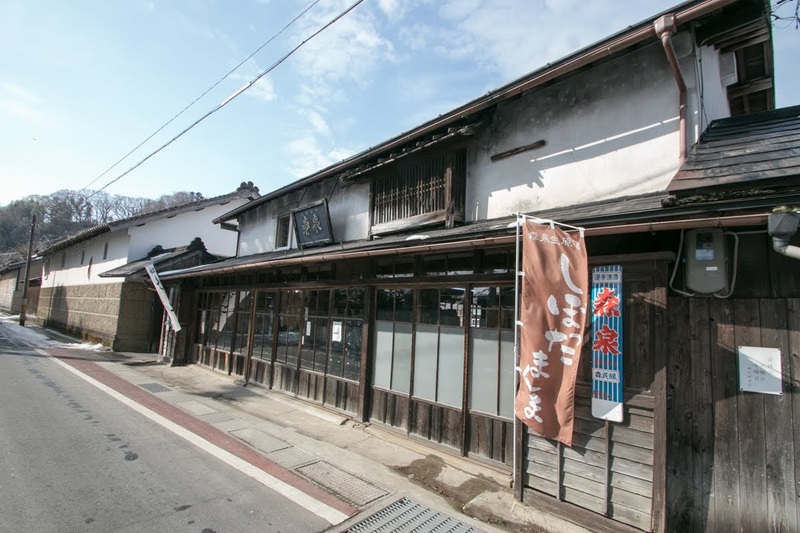 Masamune also had to restore his devastate territory, but some retainers dissatisfied with lesser and damaged territory left Date clan. Even though still a lord, for young and ambitious Masamune it might seem like an exile. After the death of Hideyoshi in 1598, the situation of Masamune drastically change. 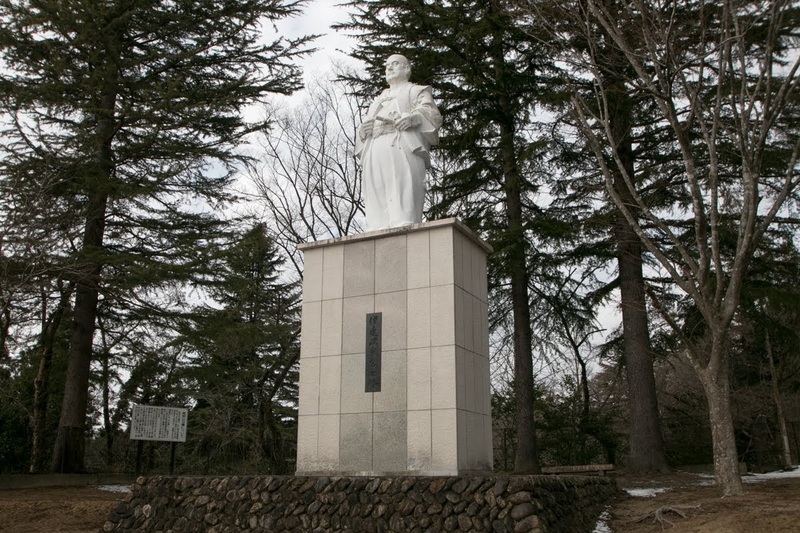 Masamune allied with Ieyasu Tokugawa, by marriage of both sons. 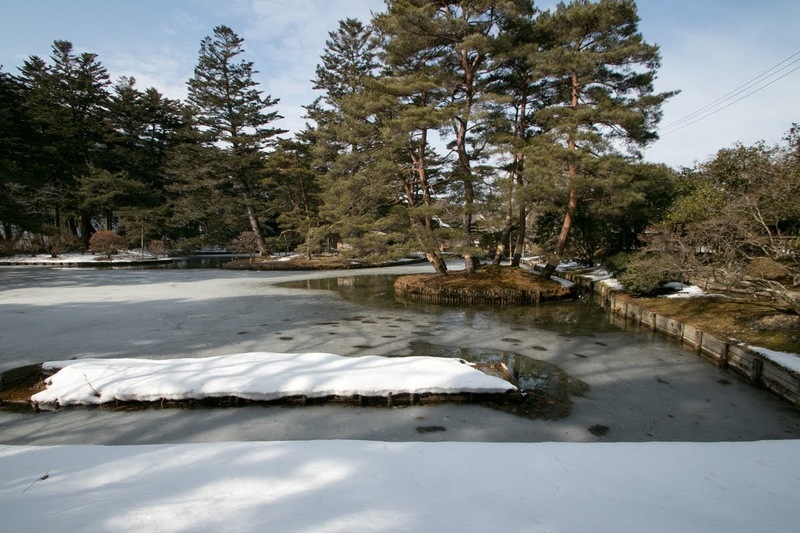 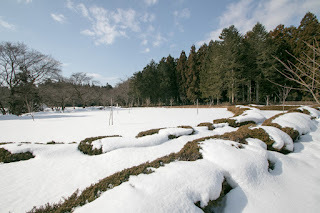 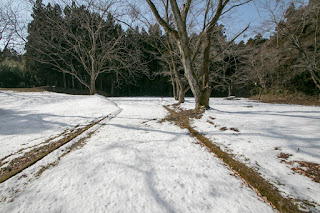 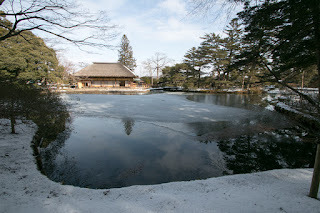 At the conflict of Ieyasu and Mitsunari Ishida (1560-1600), the chief magistrate of Toyotomi government, Masamune belonged to Ieyasu and faced with Kagekatsu Uesugi (1556-1623), the lord of Aizu Wakamatsu castle (Fukushima prefecture) who belonged to Mitsunari and held Date region, the original territory of Date clan. 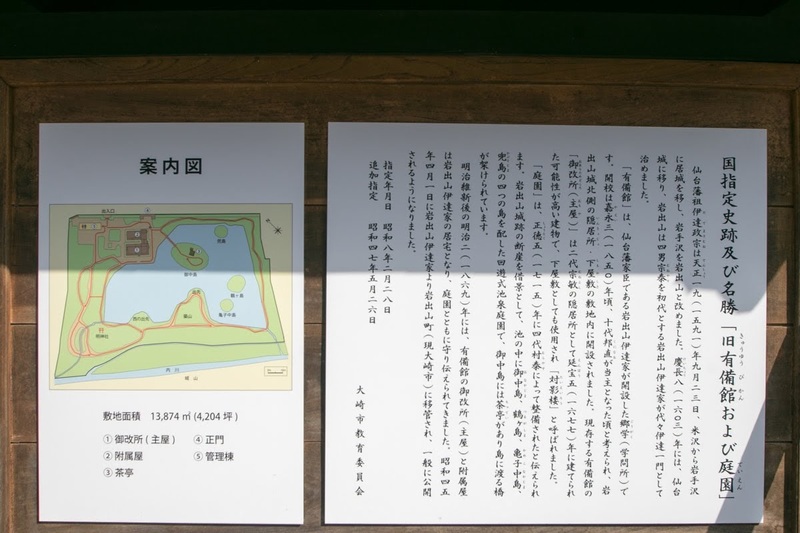 Ieyasu gave the certification of Date region to Masamune, then Masamune attacked Uesugi army and at first captured Shiroishi castle. 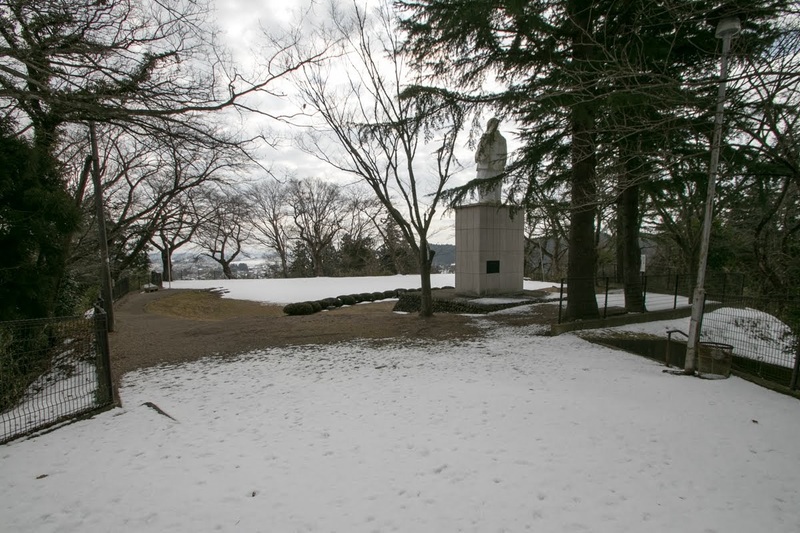 As Ieyasu once returned to central area to make decisive battle with Mitsunari, Uesugi army attacked Mogami clan then Masamune unwillingly rescued Mogami army. 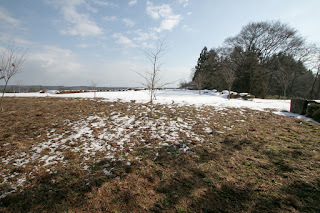 But after the victory of Ieyasu at the decisive battle of Sekigahara, Uesugi clan became isolated and had to guard their territory. 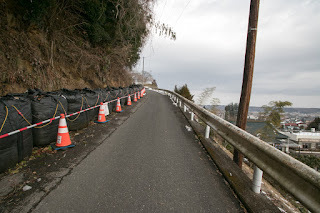 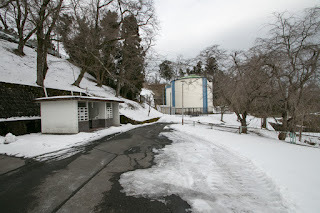 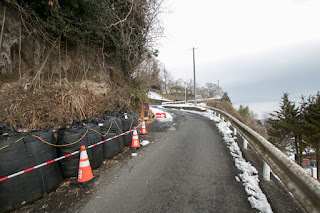 Masamune attacked Fukushima castle protected by Shigenaga Honjo (1540-1614), a general of Uesugi army, but in spite of continuous attack Date army could not fall it. 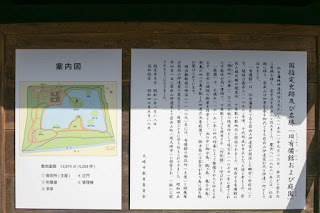 Furthermore, the fact that Date clan urged rebellion at Waga area, the territory held by Nanbu clan which also belonged to Ieyasu, became clear. 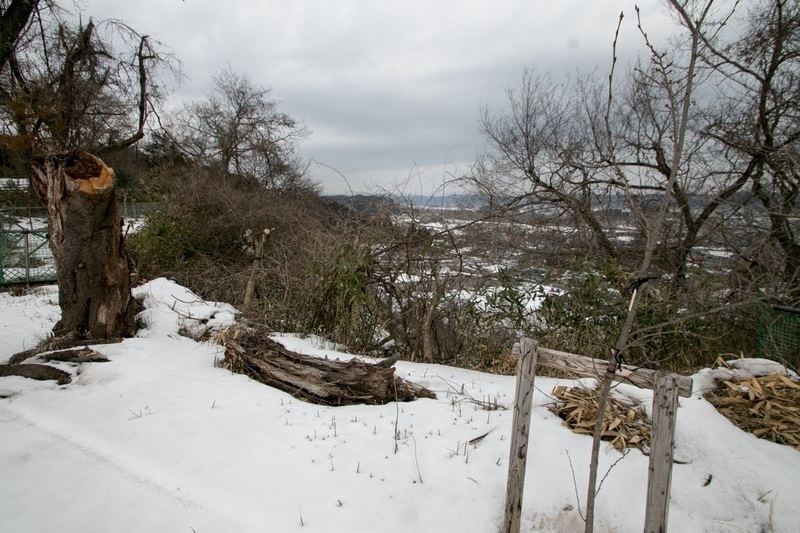 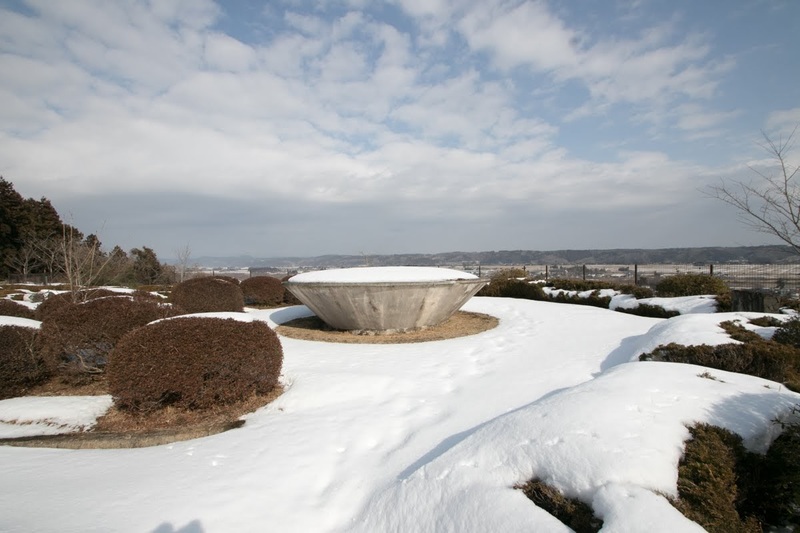 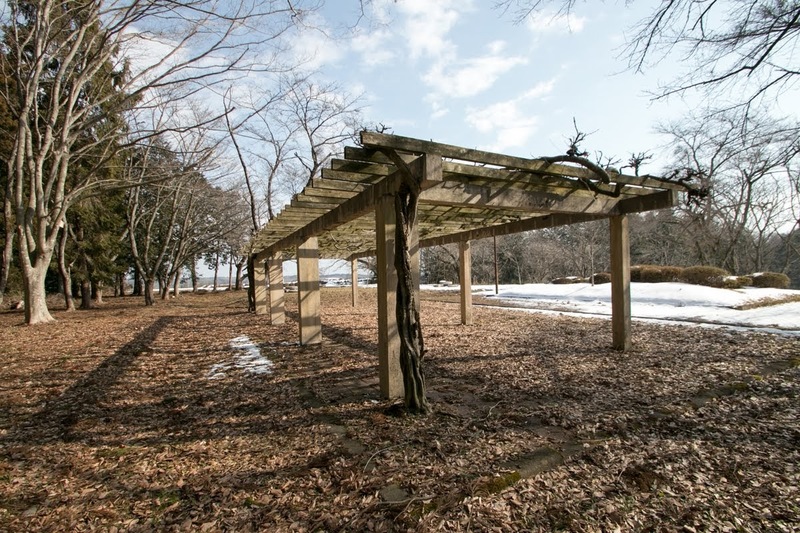 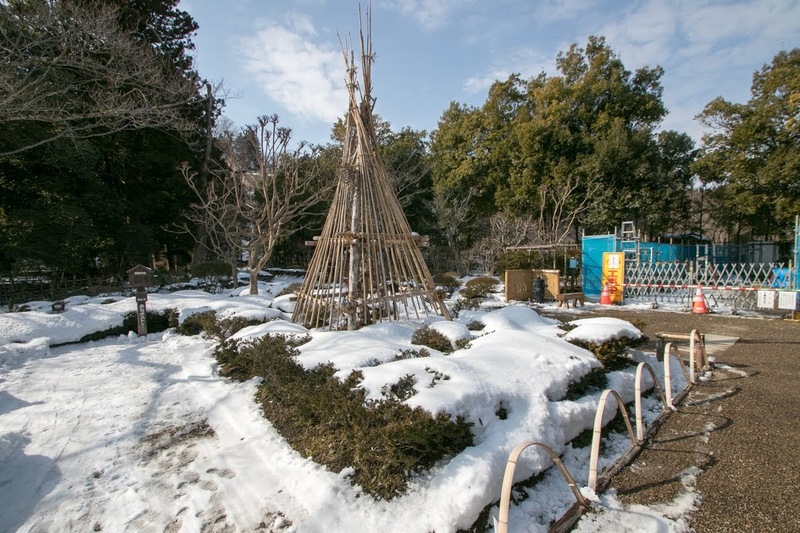 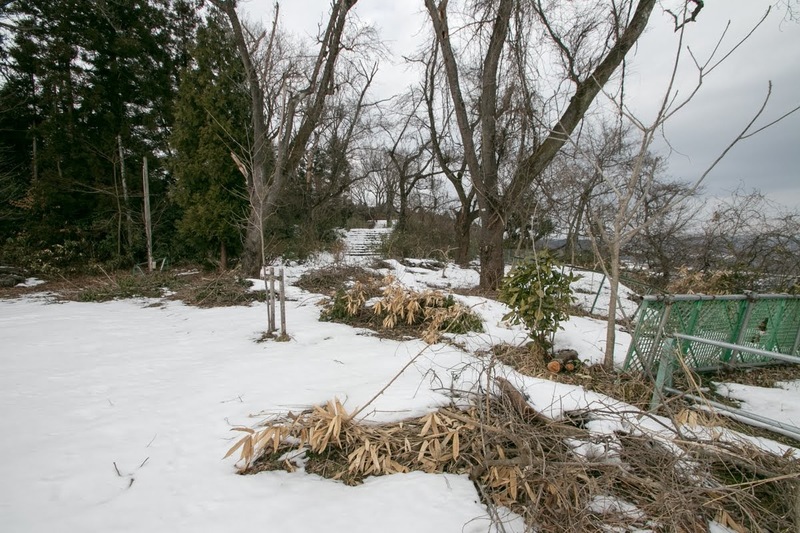 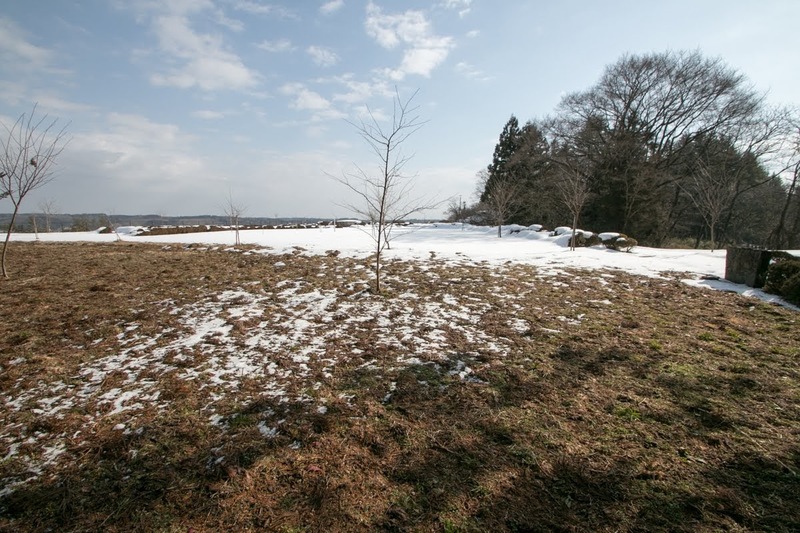 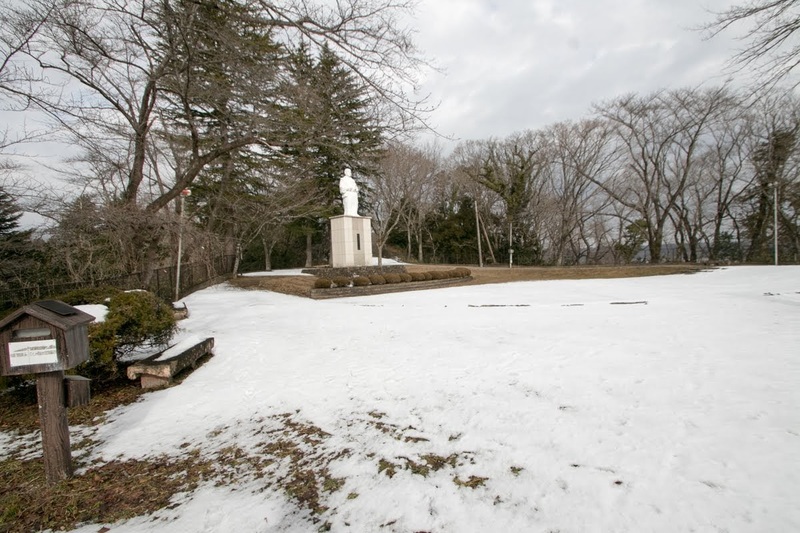 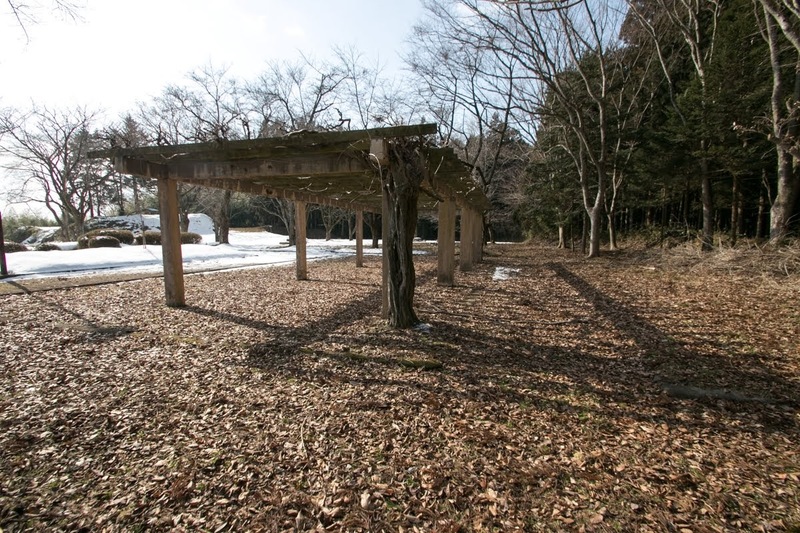 Former certification of Date region was cancelled, and only Shiroishi castle was approved as a reward, and the ardent wish of Masamune for recovery of original territory did not realize. In 1601, without limitation from Hideyoshi, Masamune started construction of Sendai castle, where had a larger land to build castle town and was close to the port. 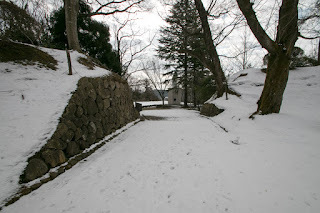 After the completion Masamune moved his main base to Sendai castle (Miyagi prefecture) newly built in 1603, but Iwadeyama castle was kept as a branch fort. 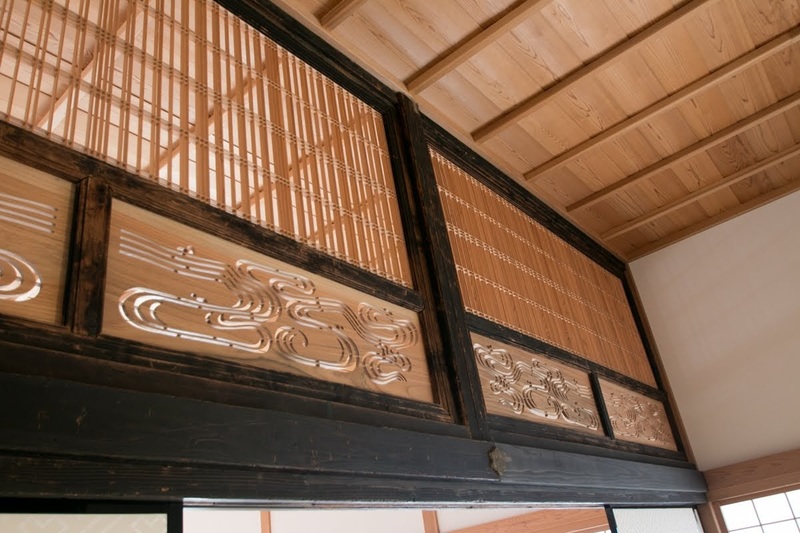 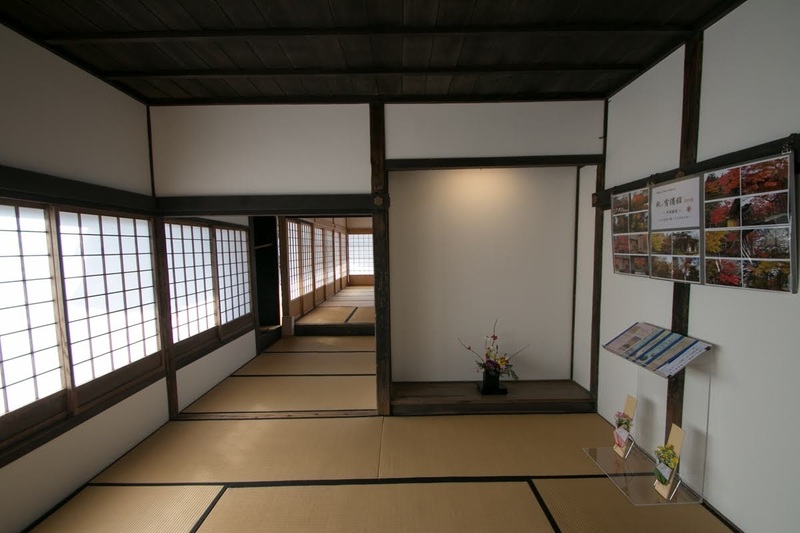 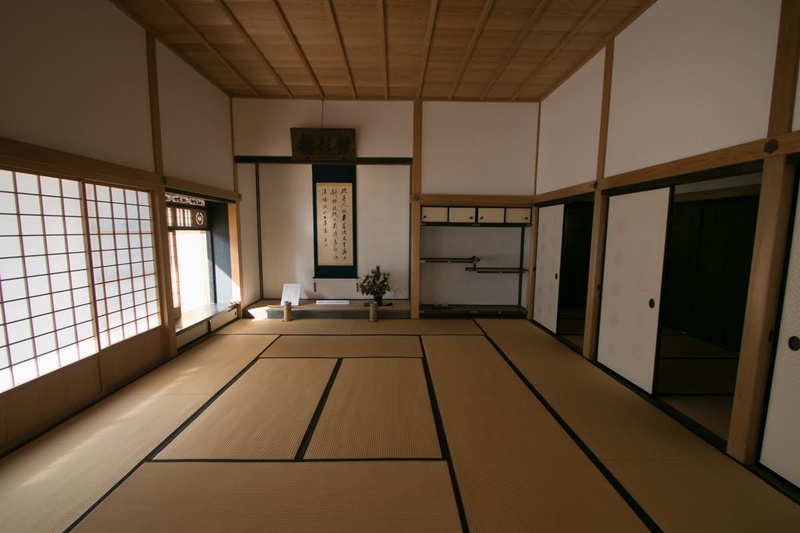 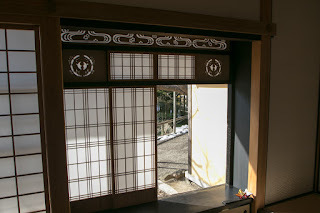 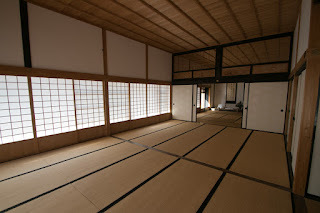 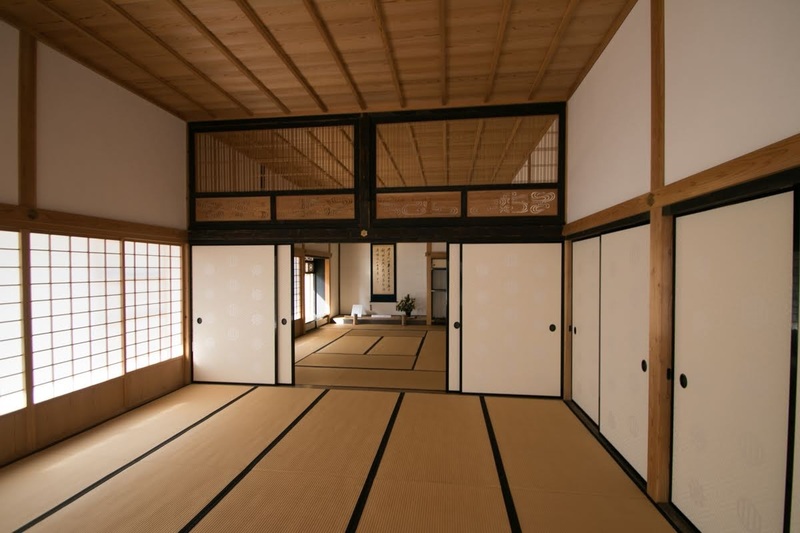 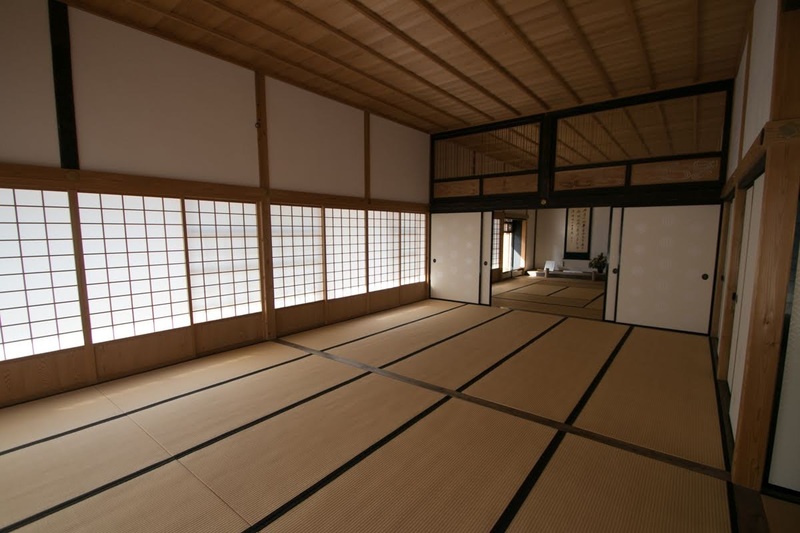 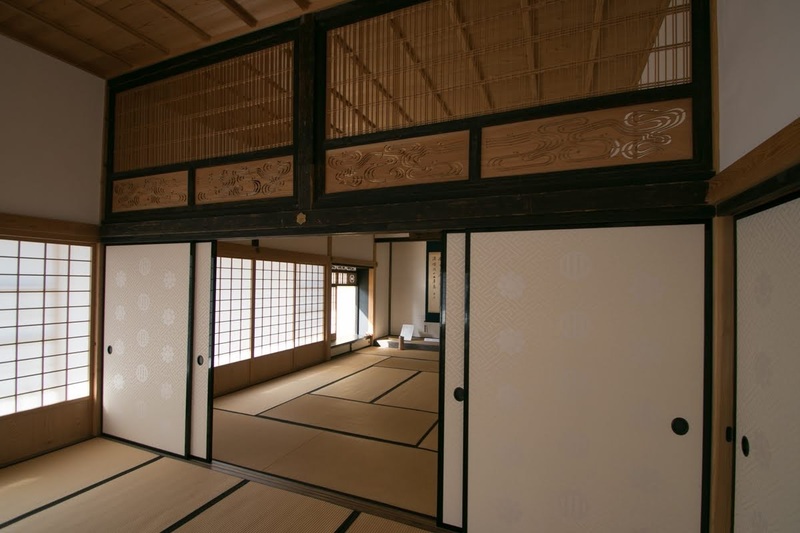 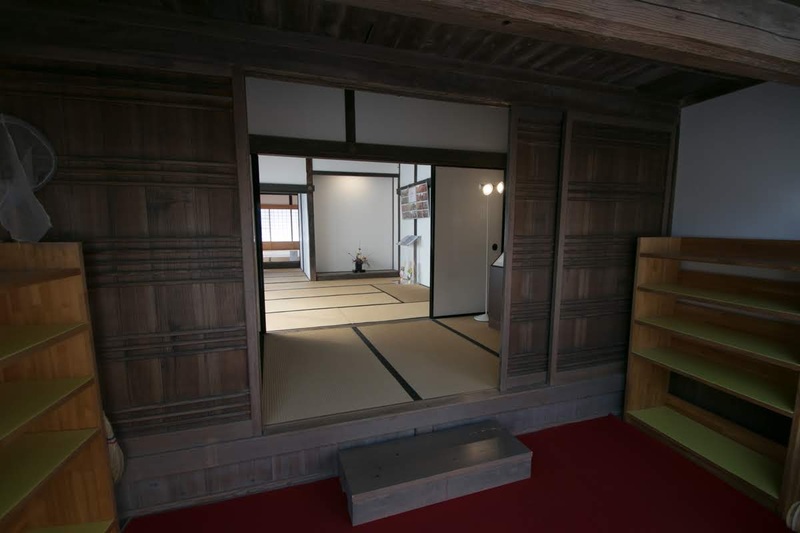 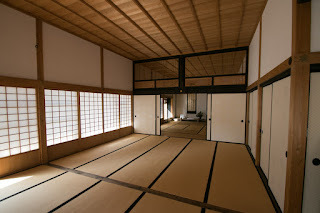 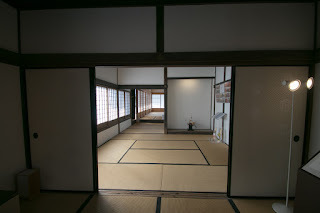 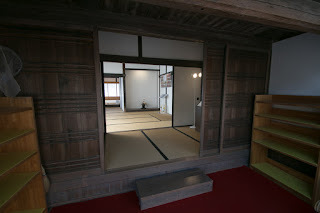 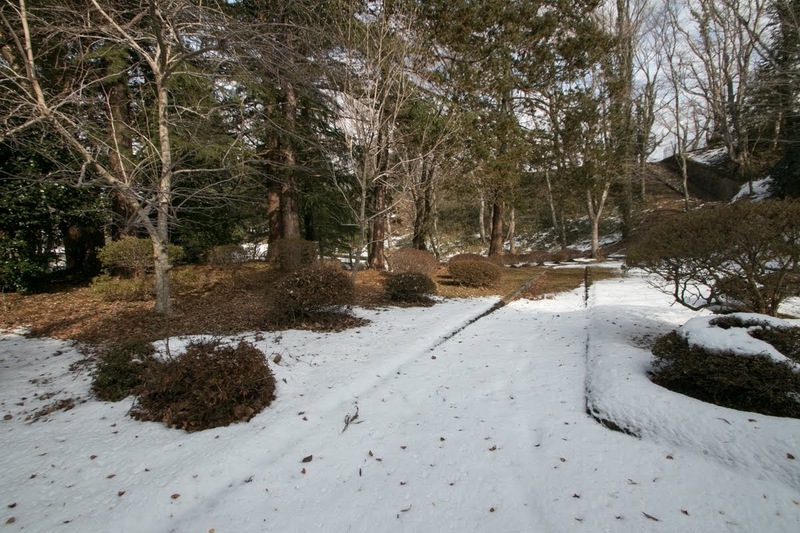 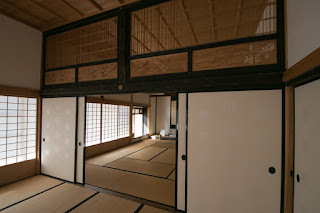 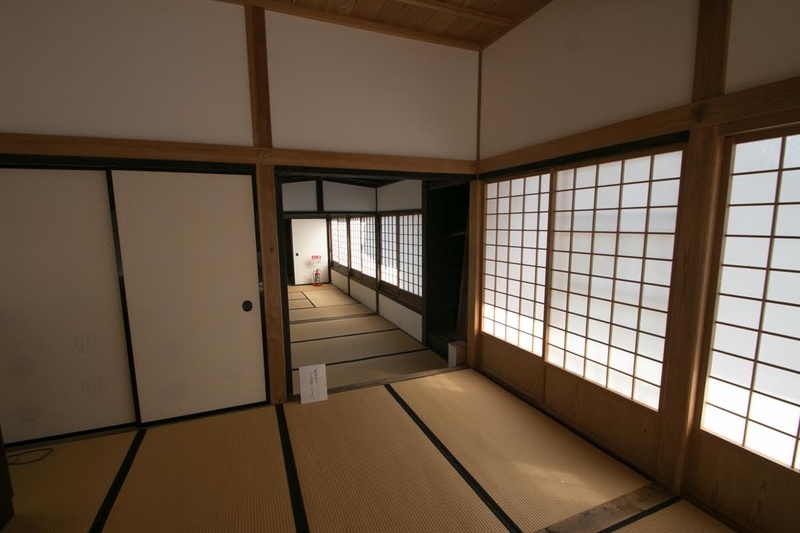 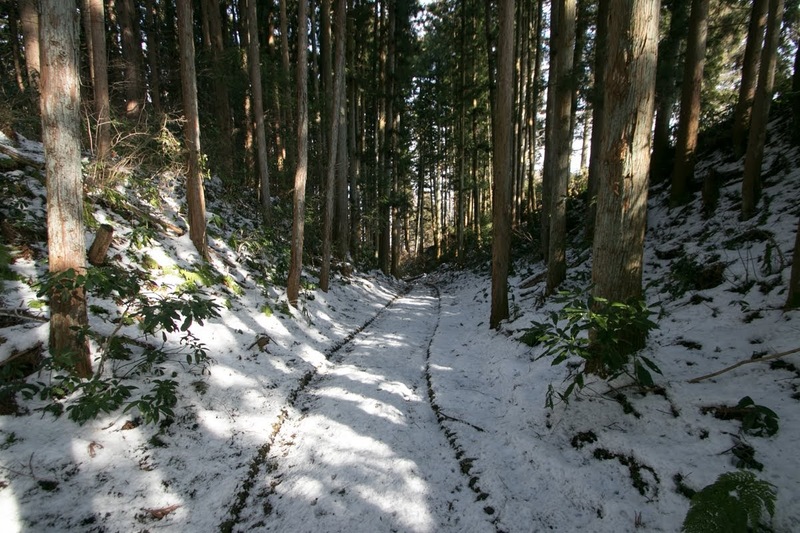 Branch family of Date clan held Iwadeyama castle by the end of Edo era. Today no building is left but shapes of castle roughly remain on the hill, even though modified by creation of the park. 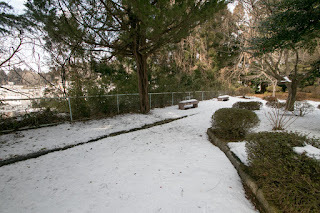 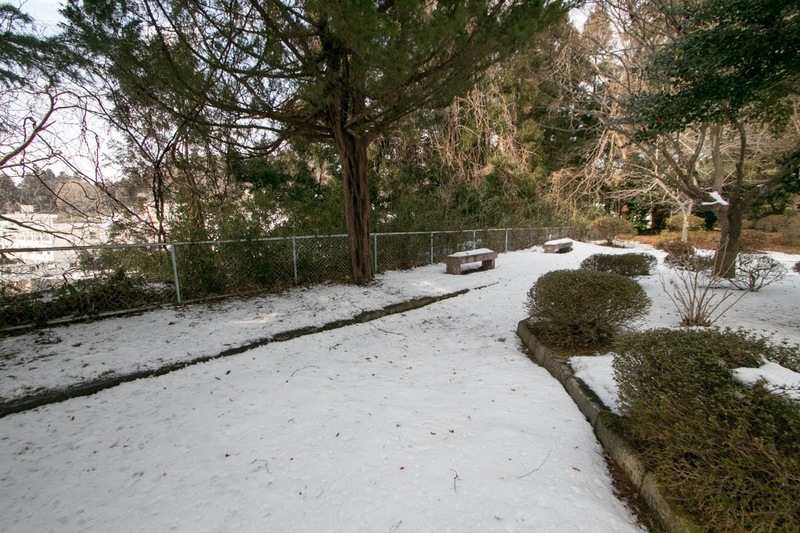 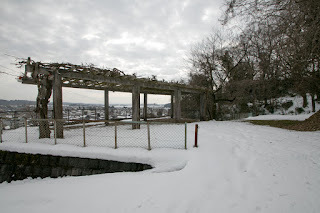 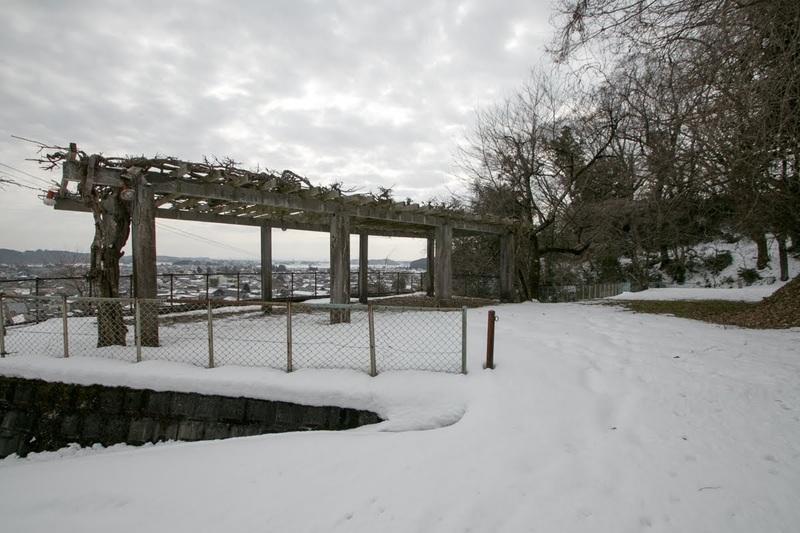 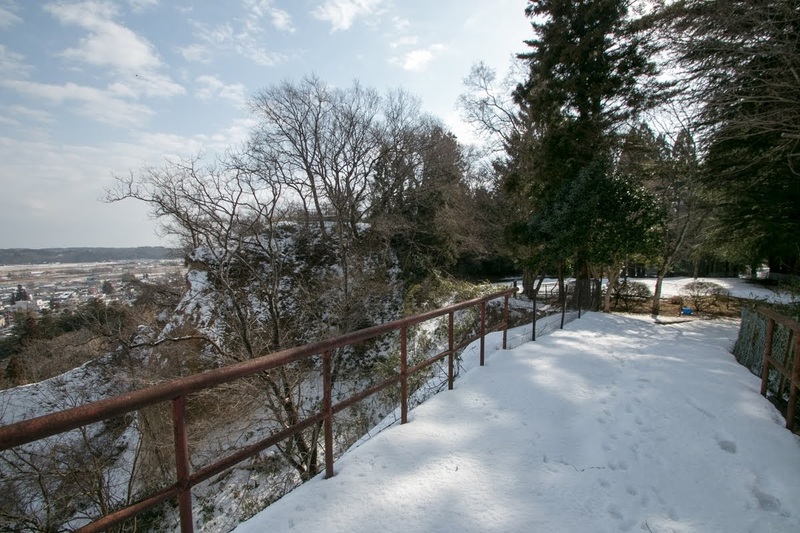 Now castle site become a park covered with various flowers, and at the eastern side of the hill, the building and beautiful garden of Yubikan, a domain school built in 1691 still remain. Scenery of peaceful but monotonous plain might be same as 400 years ago, when Masamune looked with feeling of mortification from Iwadeyama castle. 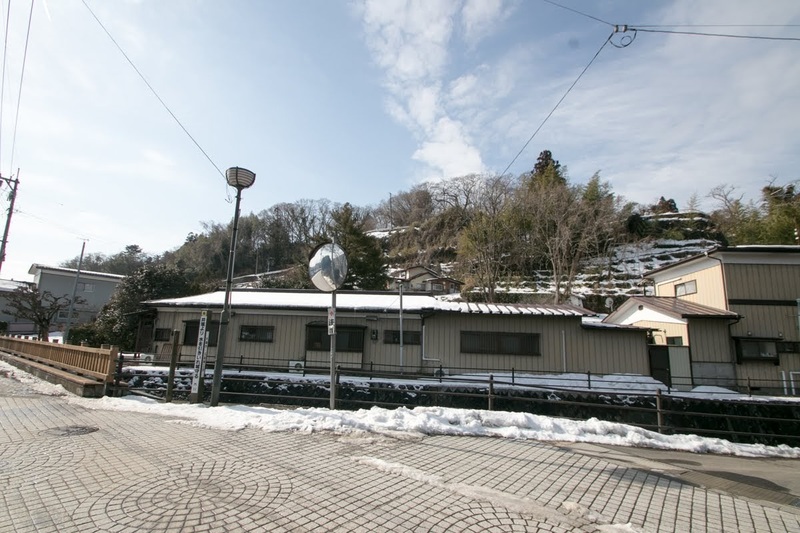 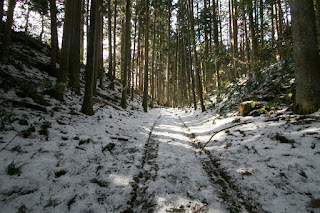 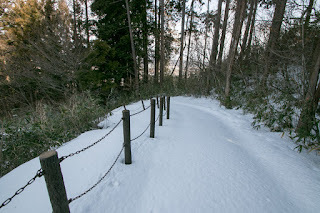 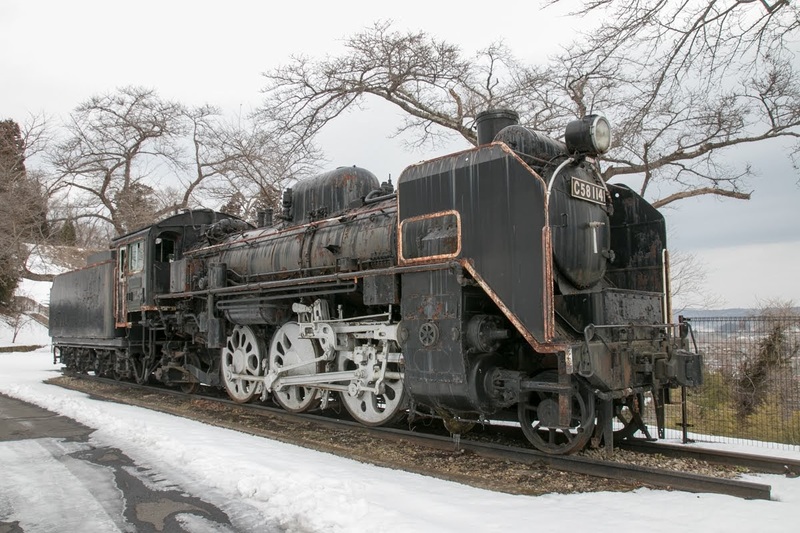 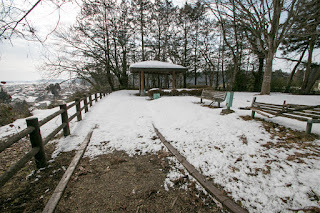 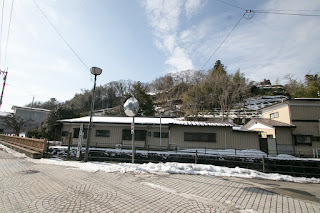 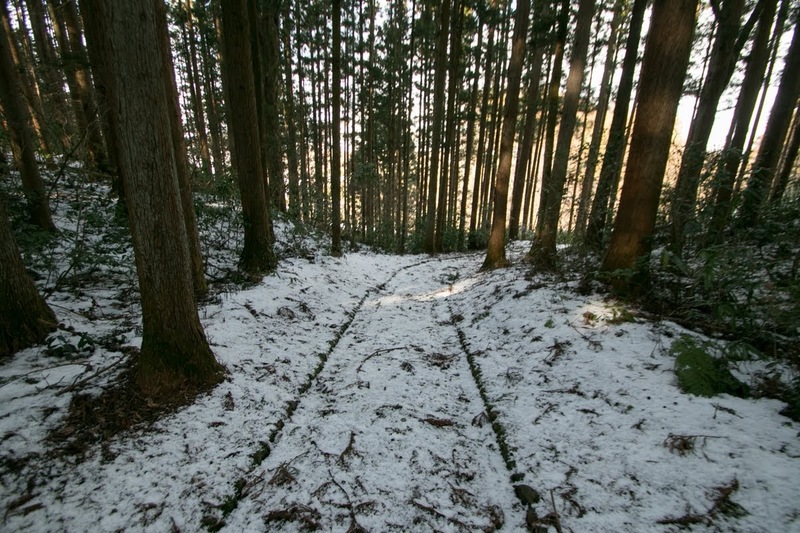 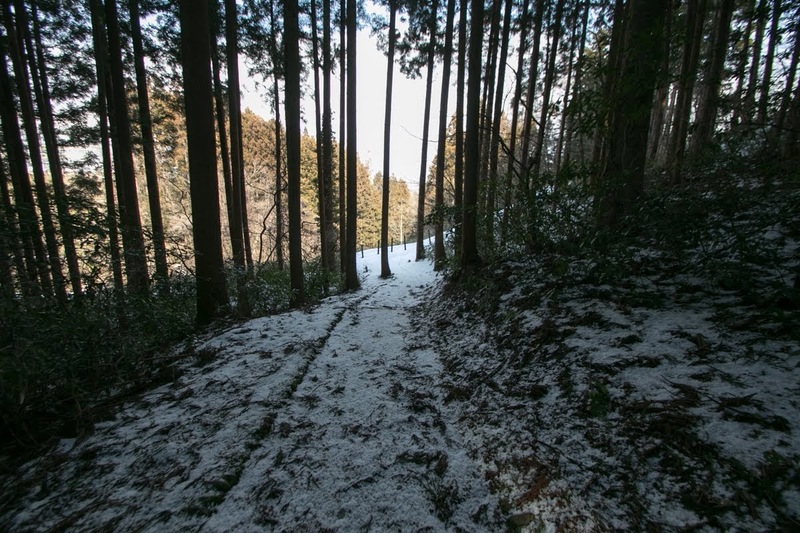 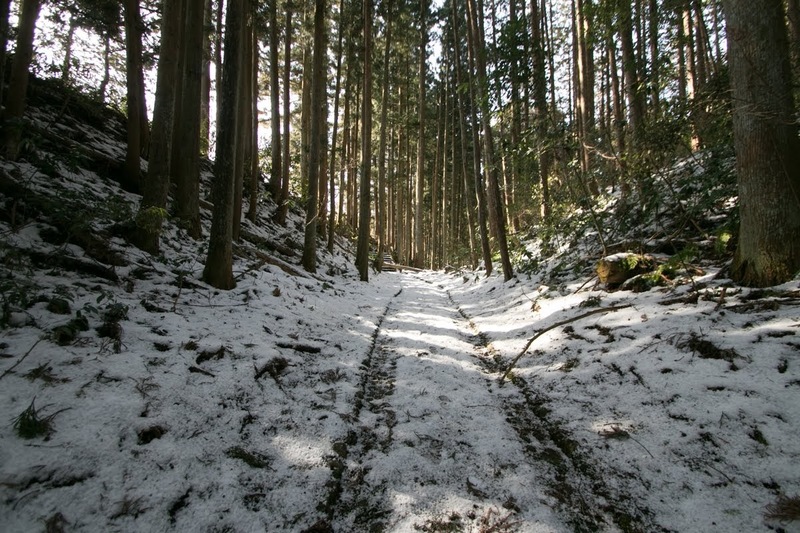 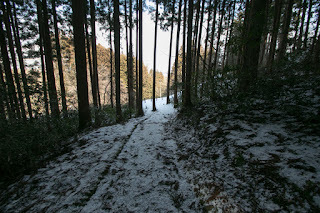 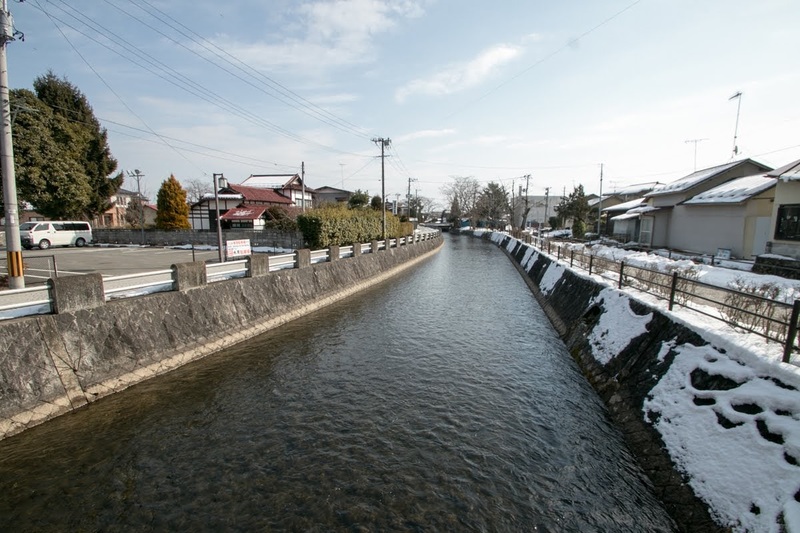 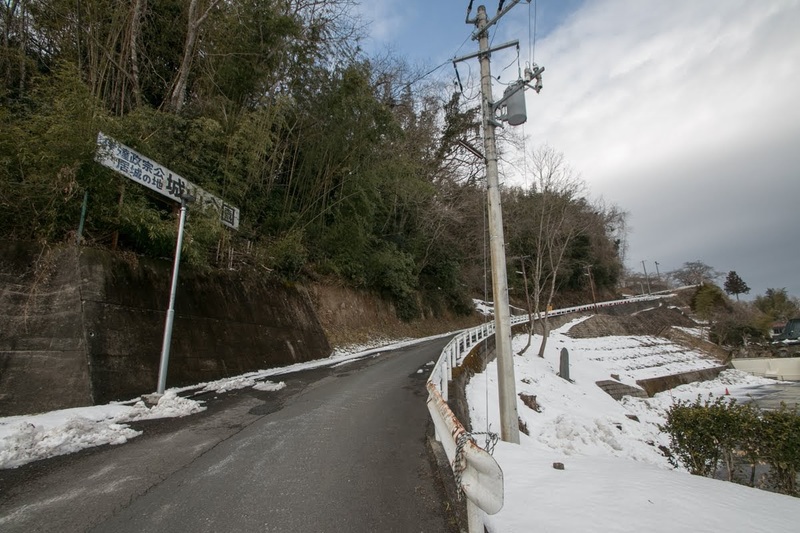 15 minutes walk from JR East Iwadeyama-Tousen (Okuno-Hosomichi Yukemuri line) Iwadeyama station. 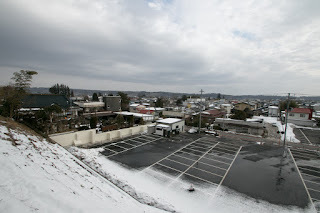 15 minutes drive from Tohoku Jidoshado Expressway Furukawa interchange to hilltop parking.